I Hope He Is Right! I hope he is right! He being Punxsutawney Phil. 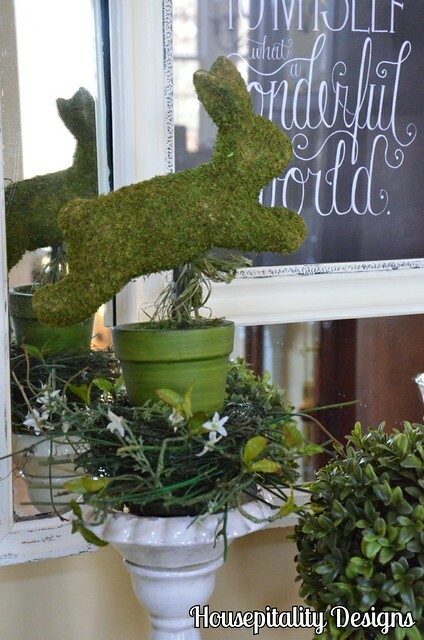 I hope that he truly did not see his shadow, as I am so ready for Spring! There have been too many days of being house bound due to the icy weather. 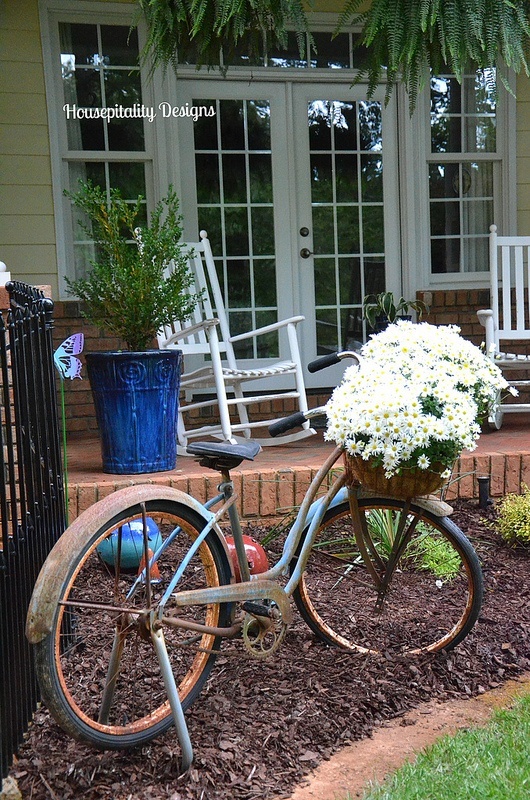 I long for pretty flowers and the projects of Spring. and not adorned with flowers. 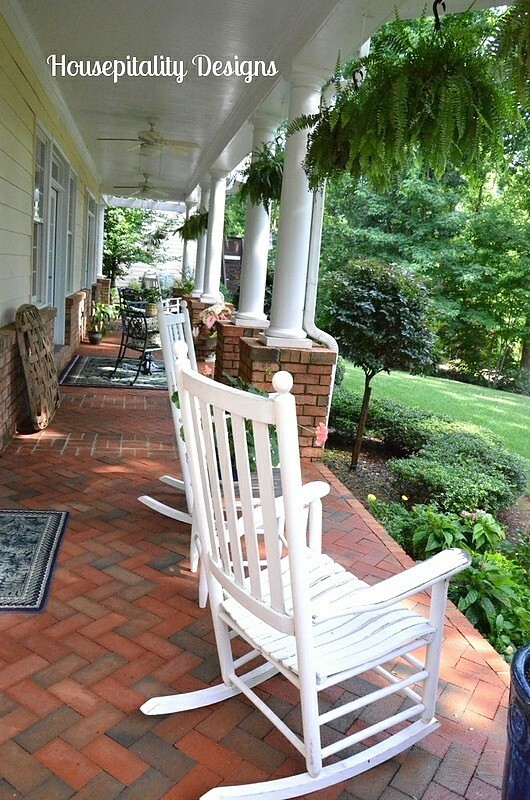 Happiness is rocking in the rockers on the veranda with a great glass of tea. 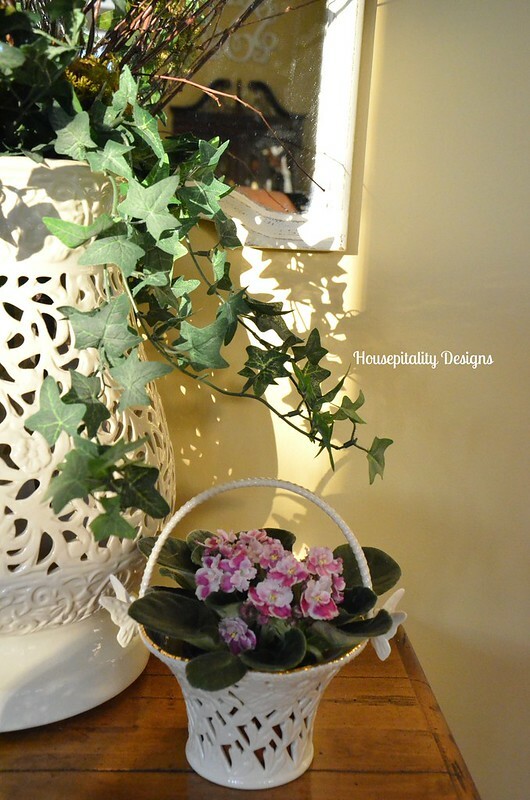 Happiness is watching the flowers grow and hoping my hydrangeas bloom this year! 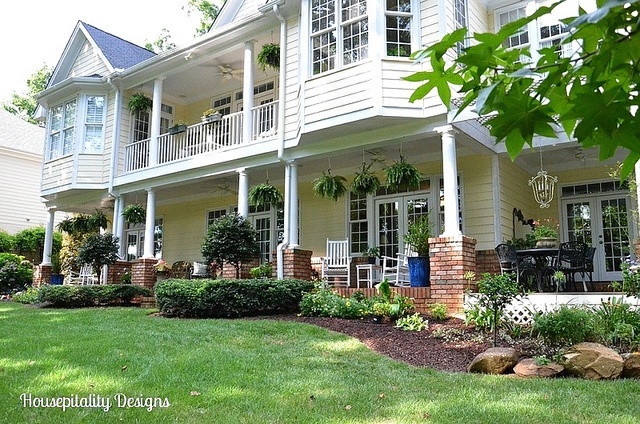 and also filling the window boxes on the upper porch with spring flowers. 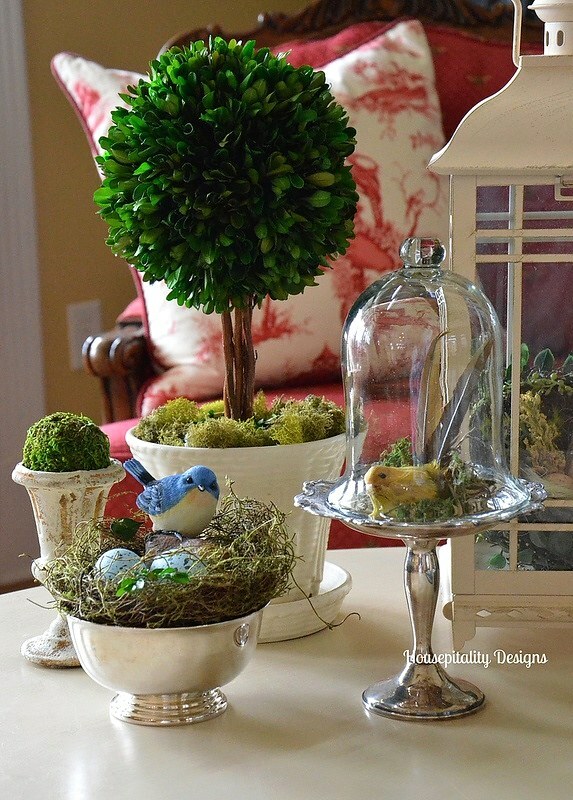 However, in the meantime, I shall plan on creating Spring vignettes. 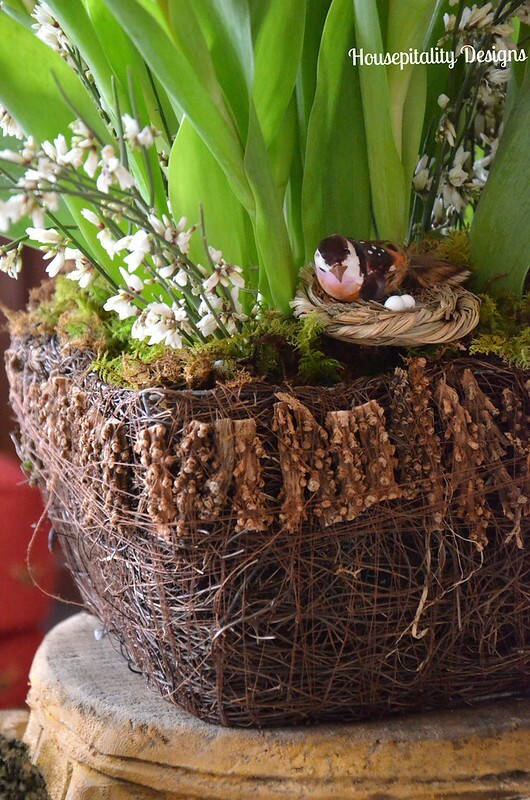 Of birds and flowers . 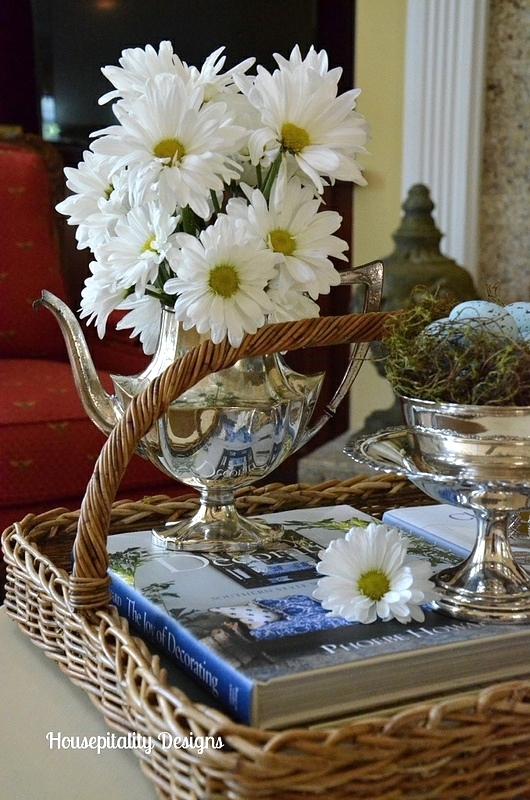 . .
Silver and Daisies . . .
that domino effect. Coming soon. Mother Nature wants us to? Have a beautiful winter’s day! Well, that did not last long . 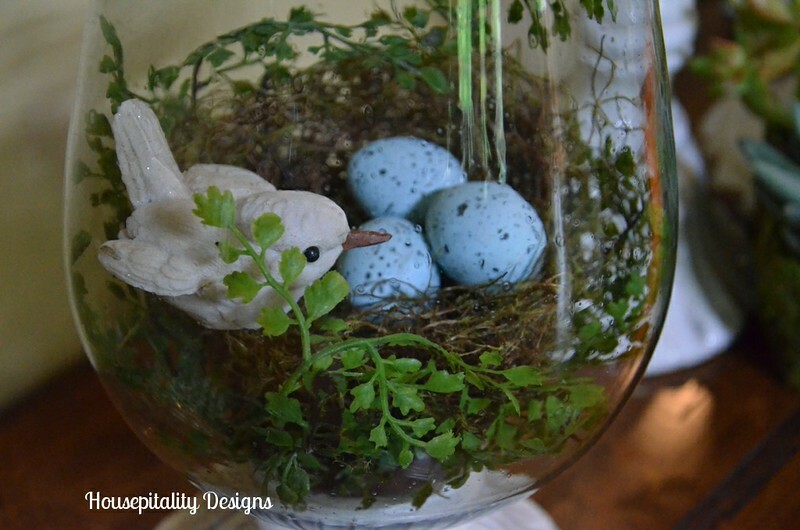 . .
empty after their departure, I created another Spring vignette. 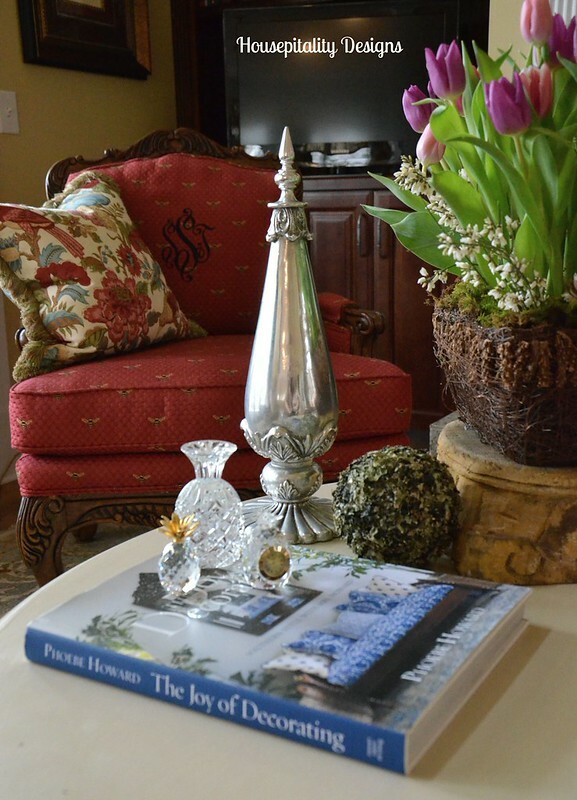 Spring enhancements to the room are happening every day. 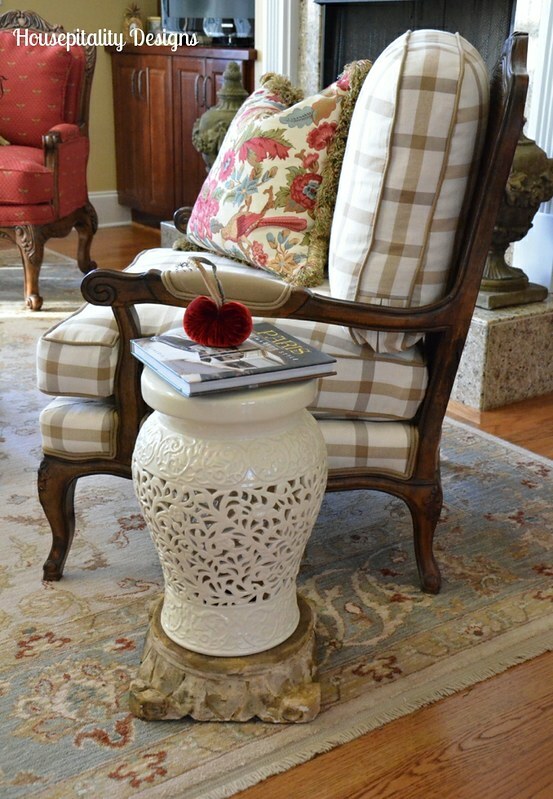 I have a pair of cream colored reticulated garden stools. 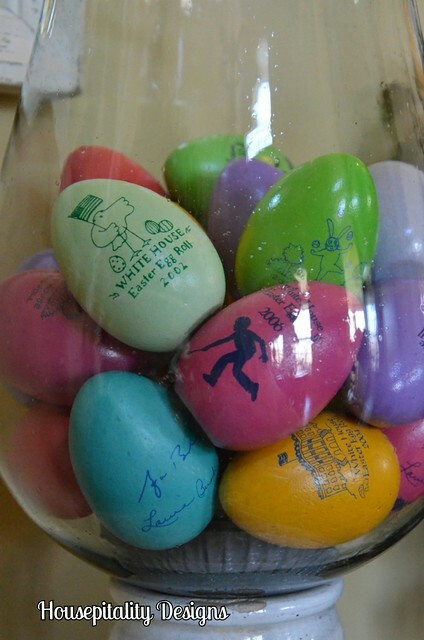 They used to be at the top of my bookcases. 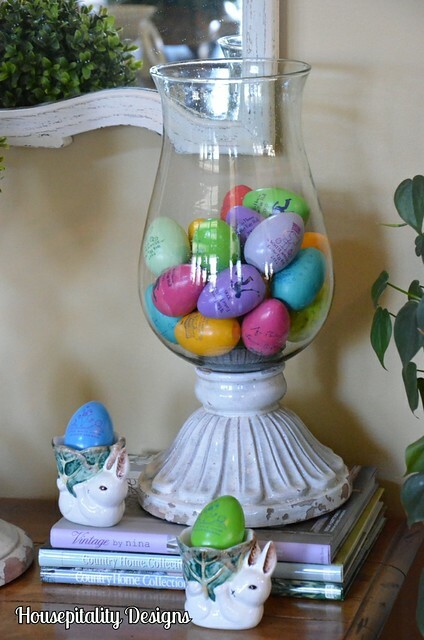 Sits next to the chair in the Great Room. 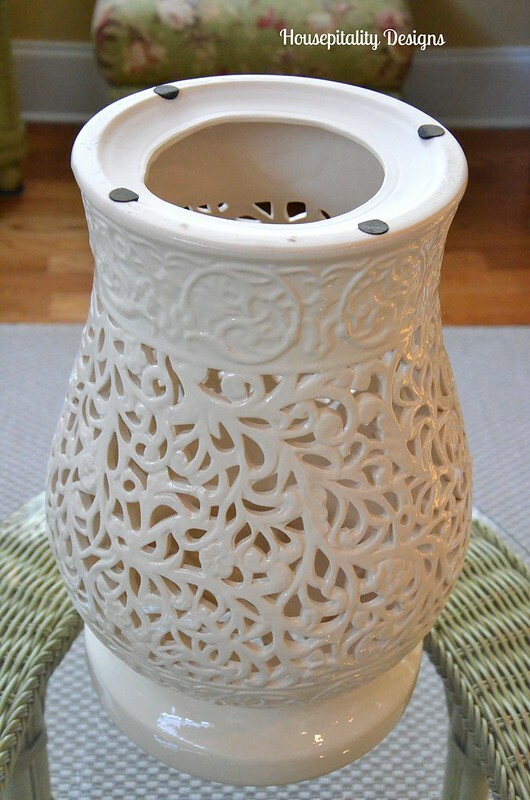 I have another one and had an “epiphany” . .
~ ~ to turn it into a large vase! 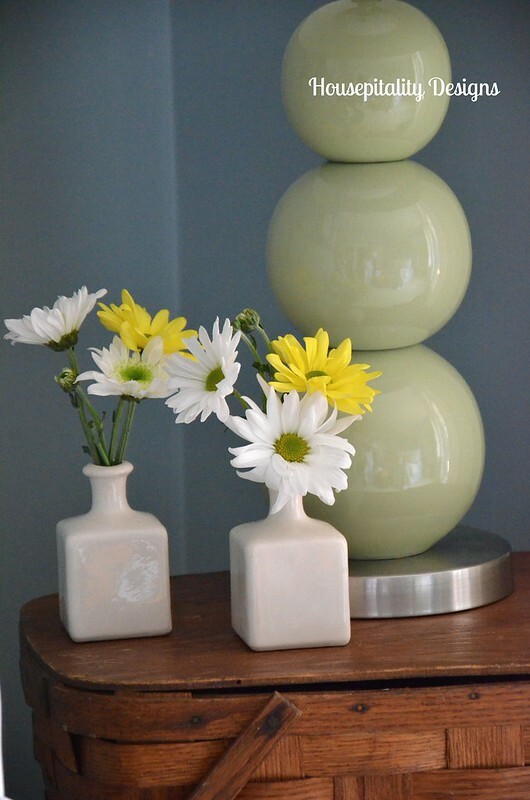 I placed some felt pads on the top to stabilize it . .
~ ~ as the top will be the “bottom” of the vase. Turned the garden stool upside down . 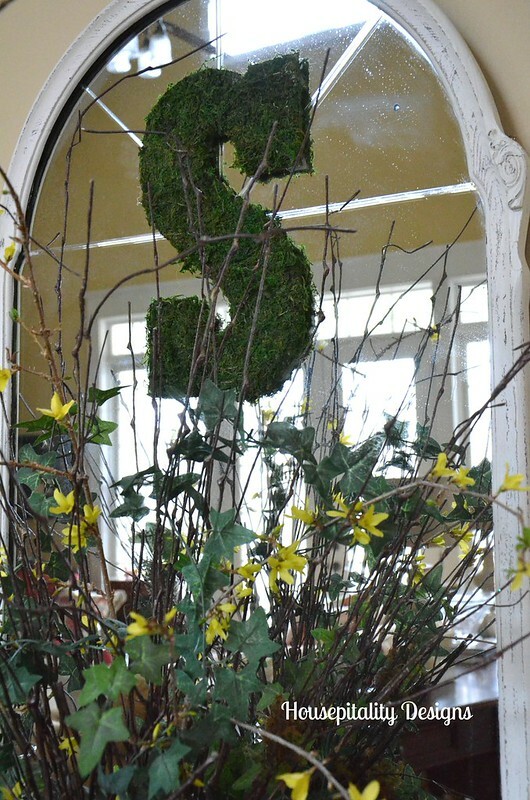 . .
Added some ivy, twigs and branches from my Forsythia bush . . 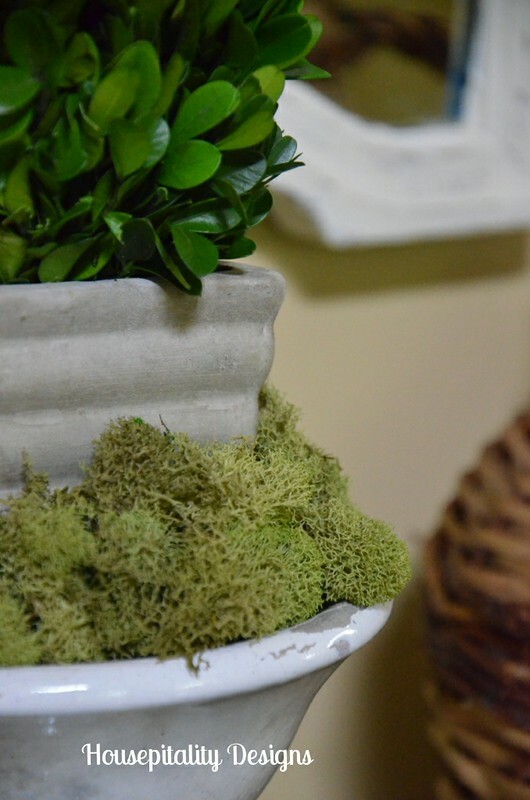 Replaced the faux boxwood wreath with an moss covered letter . . .
~ ~ ~ oh so, Common Ground’esque! 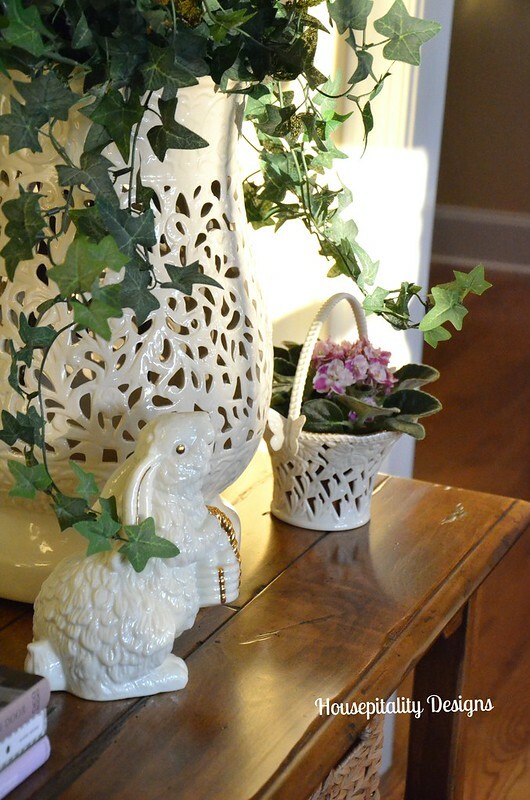 I added my Lenox butterfly reticulated basket to the vignette . . .
~ ~ I actually ditched the original pic of this and took this one this morning . .
~ ~ ~ ~ when the morning sun was streaming through the room. 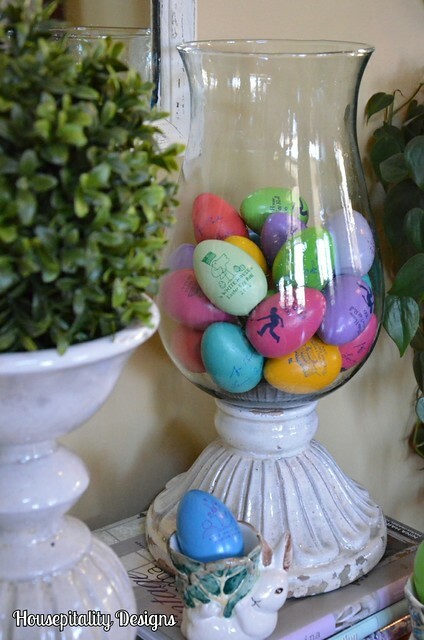 On the other side of the vase is my “special bunny” . 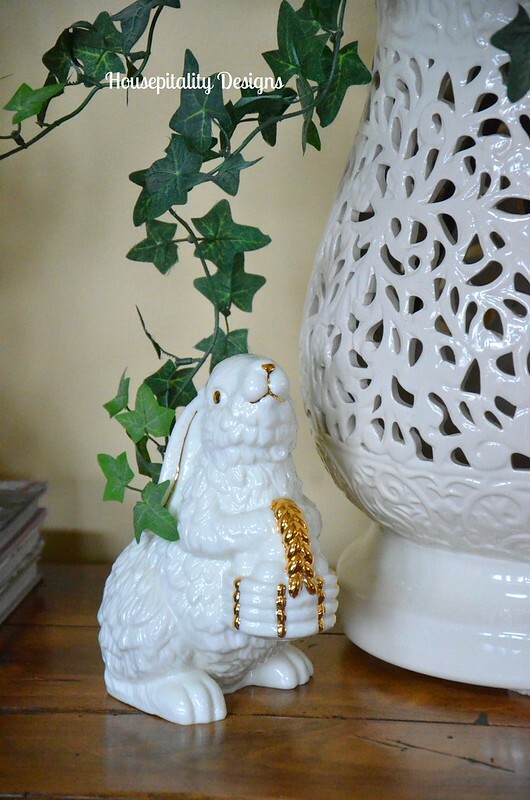 . .
~ ~ This was actually the first item I bought from what is now HomeGoods. Years ago, whenever we were in Atlanta, I would visit this particular shopping area . .
~ ~ that had a Bombay Outlet and a Calico Corners. 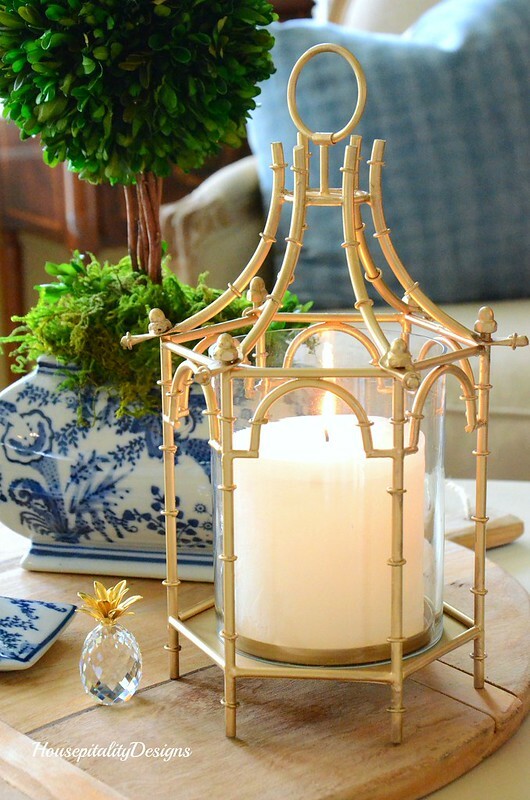 One day I noticed that a TJ Maxx and More was added to the shopping center . .
~ ~ the “More” was the addition of a tremendous amount of “home goods” . 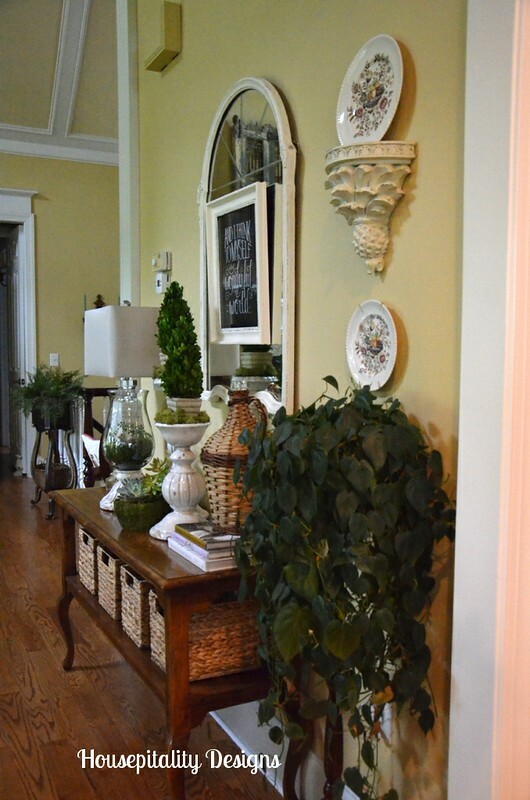 I only had time to buy one thing as just as I walked in . .
~ ~ my hubby called me and said he was ready to be picked up from his client’s office. However, the very next time we were in Atlanta, I made sure I had hours to be the store! 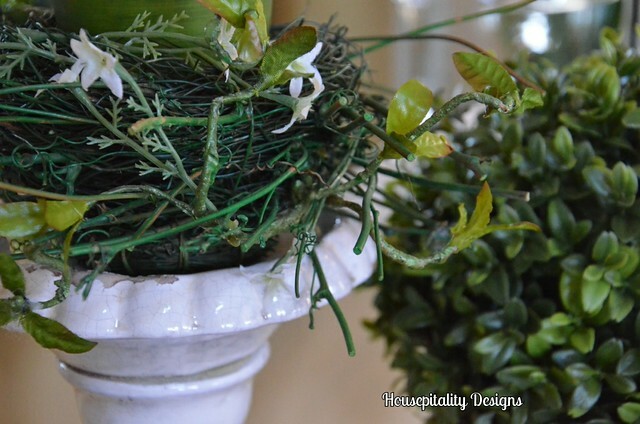 I love re-purposing items . .
~ ~ all the while I was creating this arrangement in the “garden stool” . .
~ ~ ~ ~ my hubby was looking at me as if I had two heads. 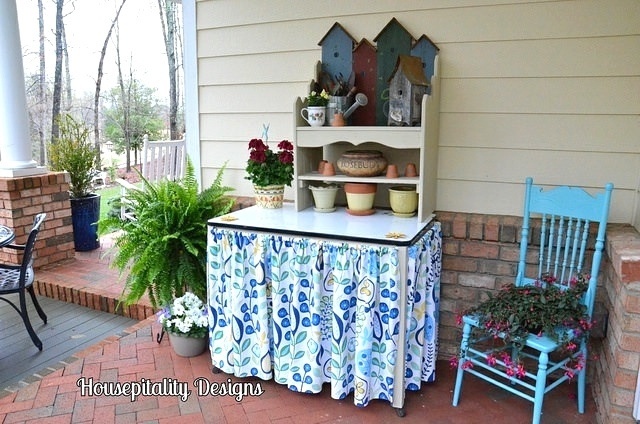 So what have you re-purposed lately? Have a most wonderful day!! 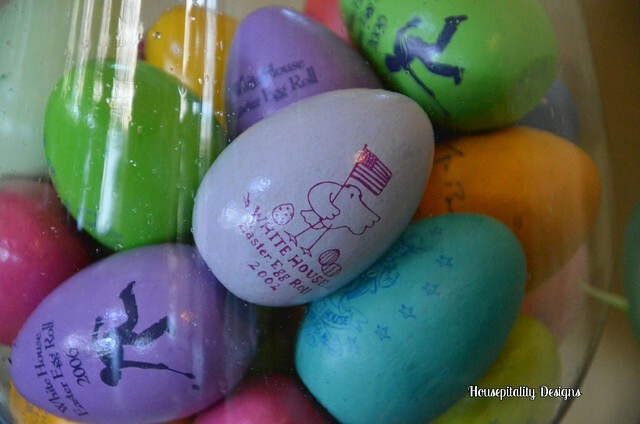 Life is full of unexpected pleasures . . or displeasures . . Yesterday, I received an unexpected pleasure . . She said, “Just Because” . . 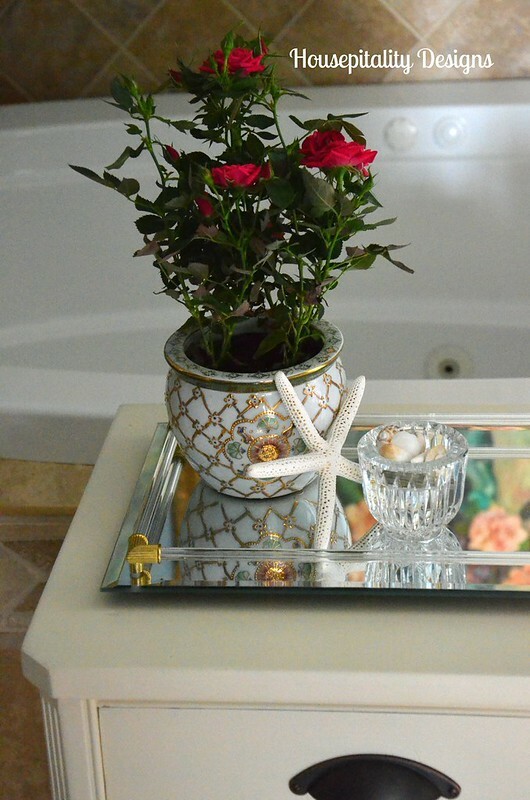 The gorgeous arrangement was from my sister, Carol. Now, if you ask me, “were you surprised” ?? ~ ~ Yes . . and no . .
A dear, dear friend of mine, who has since passed away . .
~ ~ told me I was like a bird that flew into her life giving her joy . .
Today, my sister is that bird . . . why? . . . Just because . . . I have 4 siblings . . they are all of the mindset of “just because” . . .
~ ~ a mindset of what our parents taught us on how we should live our lives. ~ ~ to be generous without provocation . . 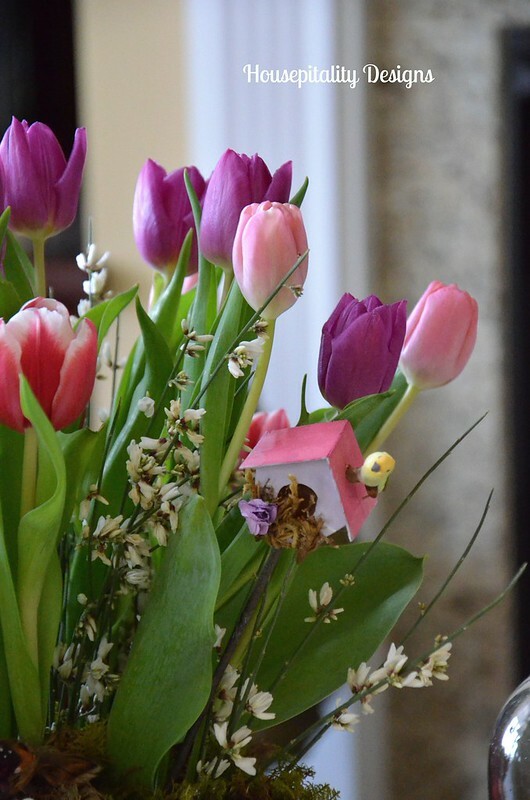 I have been blessed with the love of family and friends . .
~ ~ and I was a happy recipient yesterday . . of “just because” . .
Today, I am off to do something for someone . . “just because”. Hope you have a wonderful day doing something special, “just because” !! 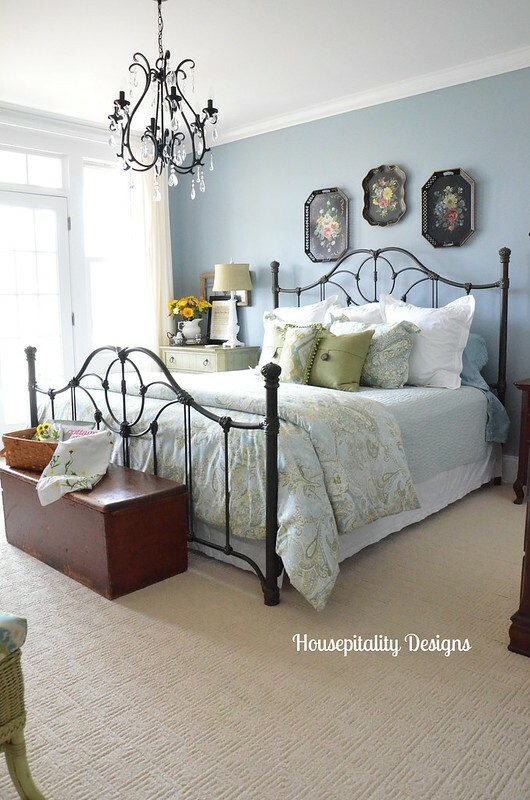 I have been busy “springifying” each room in my house . .
~ ~ and now the guest room is dressed for Spring. 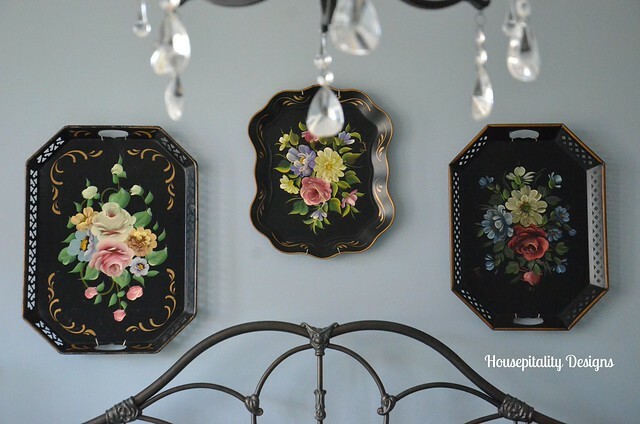 The first thing I did to “Springify” the room was to add these tole trays. .
~ ~ of great floral colors. . .
~ ~ ~ ~ they replaced my trio of fabric framed art. 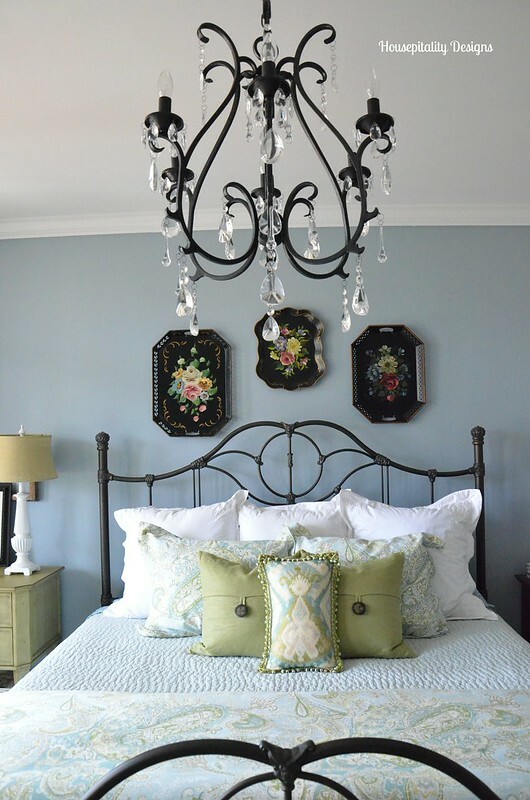 I really love how the tole trays blend so well with the bed frame and chandy. 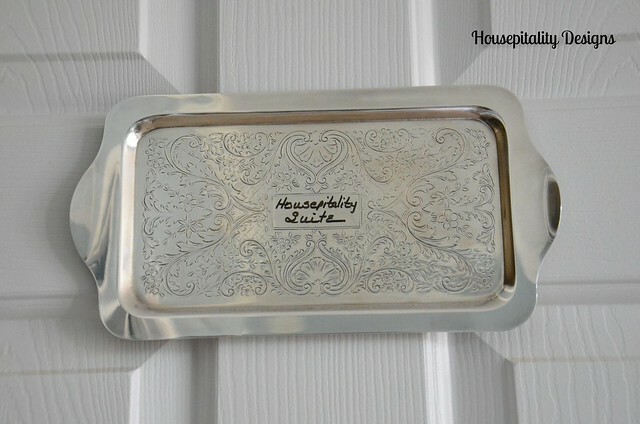 So come on in and welcome to the “Housepitality Suite” !! 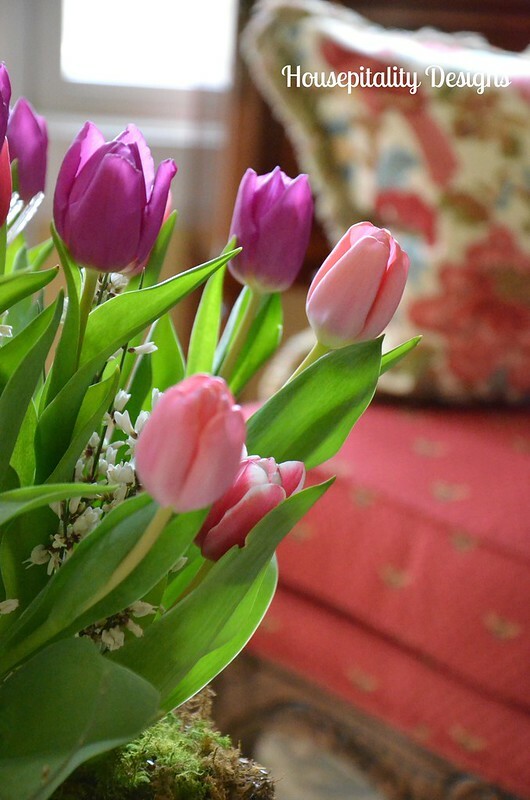 This room will be filled with company this weekend . .
~ ~ and we can all use a bit of Spring! 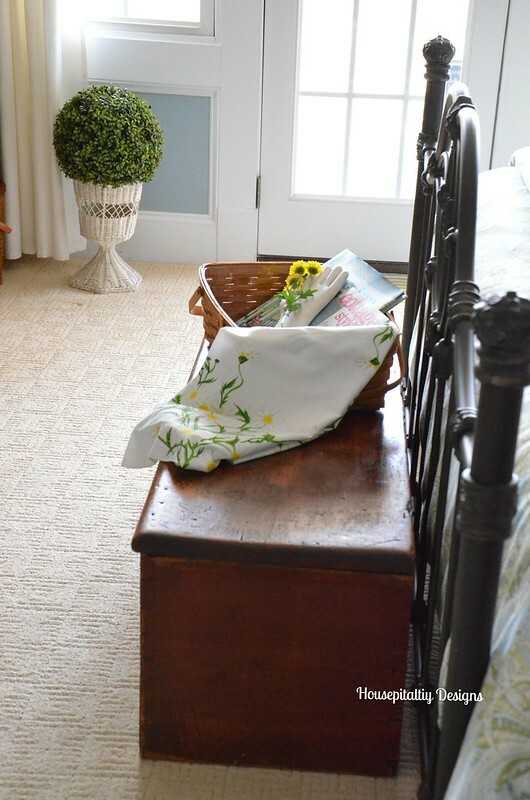 Placed a Spring vignette on the blanket chest at the foot of the bed. Filled the basket with things to read . 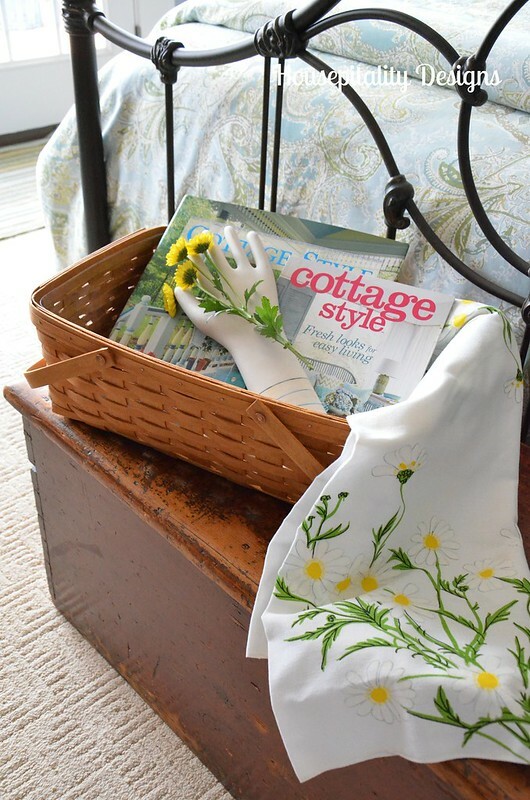 . .
~ ~ and placed a “Springy” vintage tablecloth of pretty daisies.
. . . and I will have a little bouquet of flowers to “hand” them ! 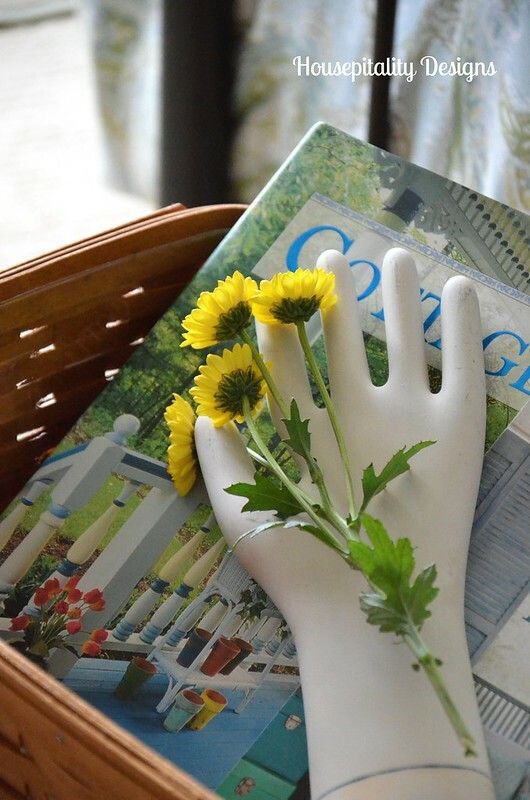 The vintage glove form is a gift from my sweet friend, Kristen. 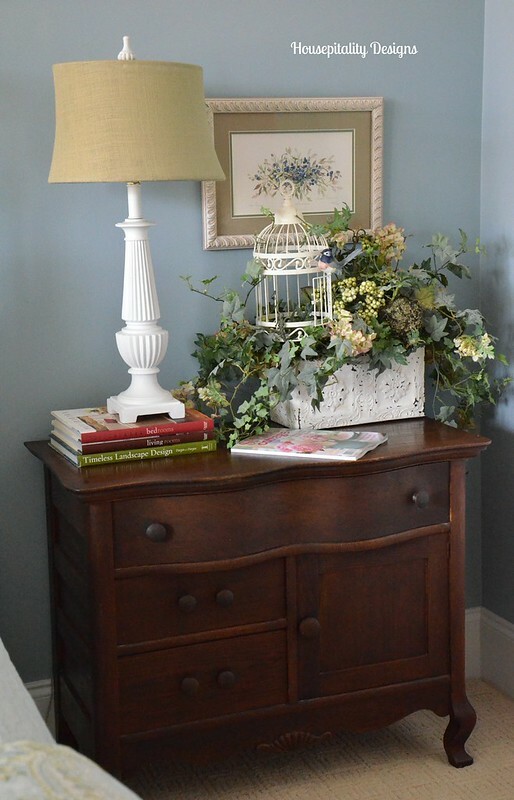 On the night stand to the left of the bed . .
~ ~ the faux hydrangeas were replaced with fresh Spring flowers. 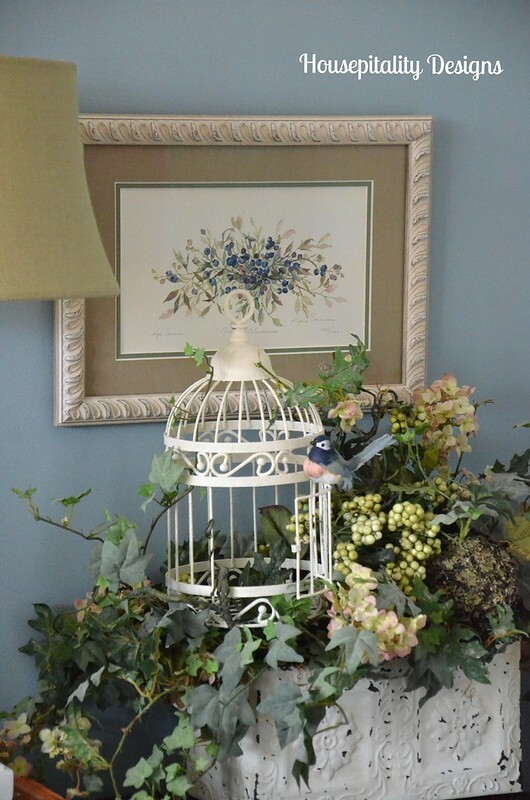 Spring decor is not complete without a bird or a birdcage . 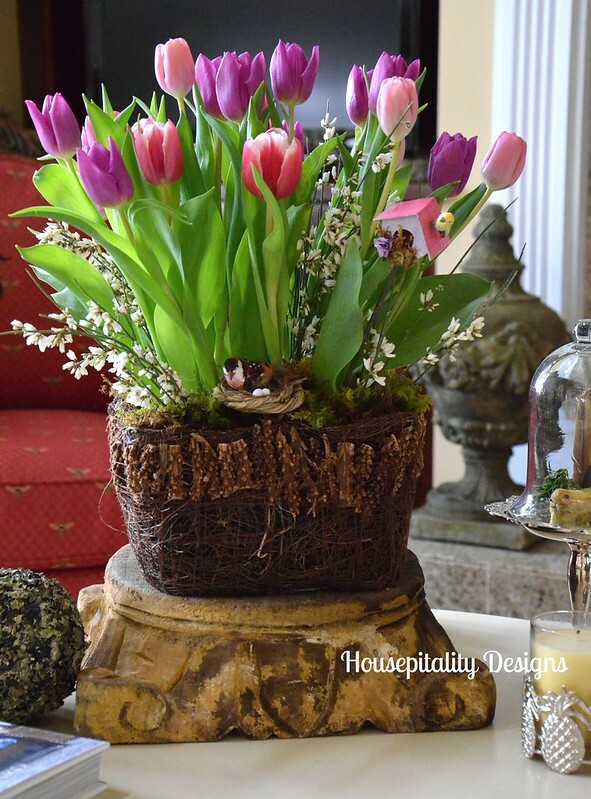 .
. . . that is nestled in a floral arrangement in a reproduction ceiling tin container.
. . . and a copy of the latest issue of Spring Cottage. 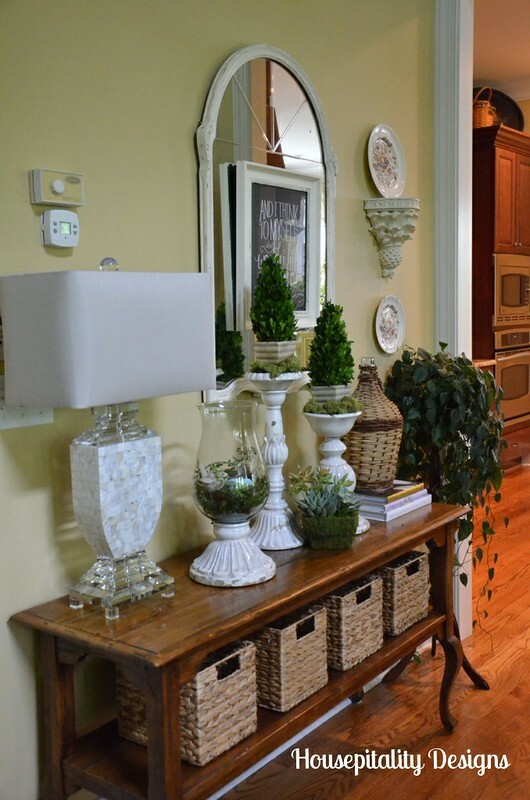 There are some changes in this side of the room . .
~ ~ can you spot them? 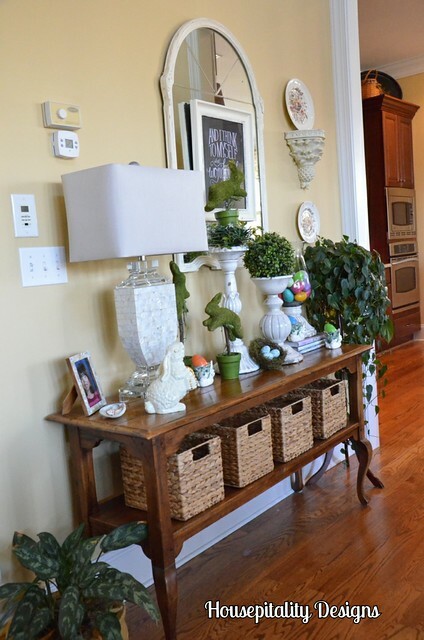 This table was previously in the sunroom . 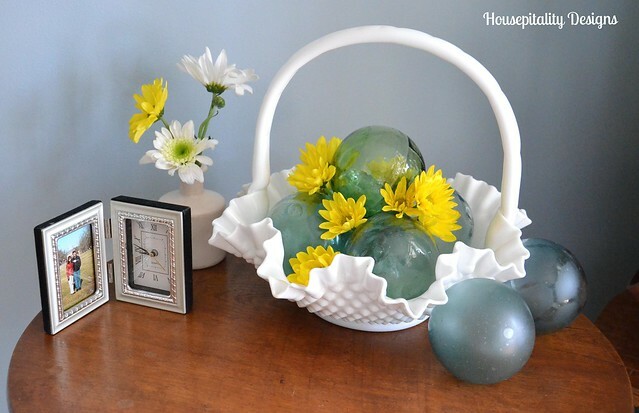 . .
A pop of color was needed in this milk glass basket of vintage fishing floats . .
~ ~ so I added pretty yellow daisies.. 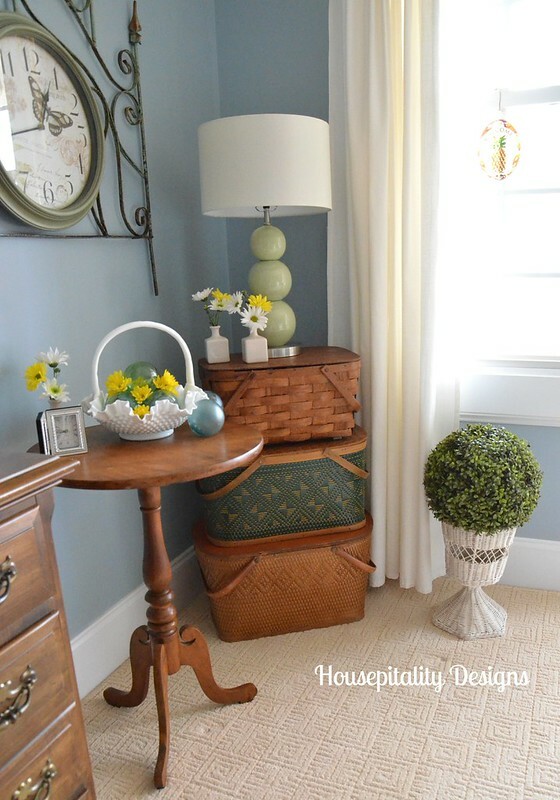 This little Spring vignette is on top of something . .
~ ~ that was previously in the media room.
. . . a stack of vintage picnic baskets. 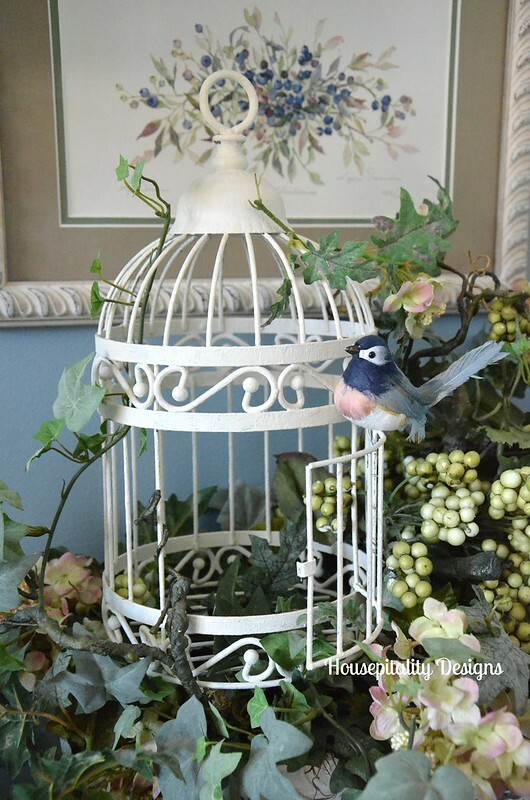 There is always room for more housing for birds!
. 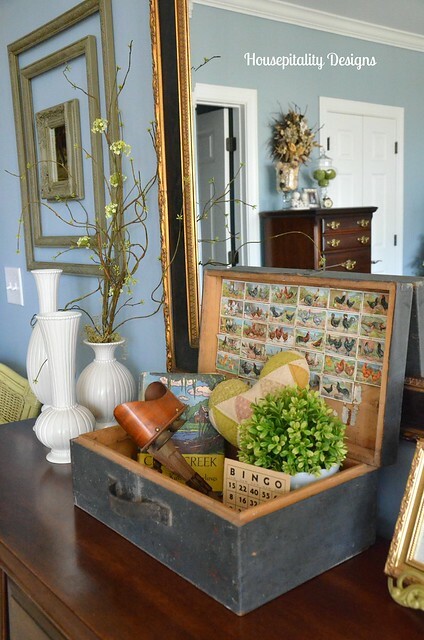 . . that is beside my French Wood Box with the chicken stamps! 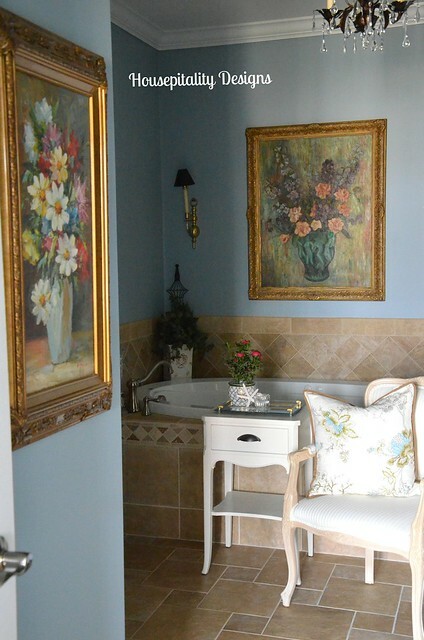 There are some changes still in the process in this guest bathroom . . 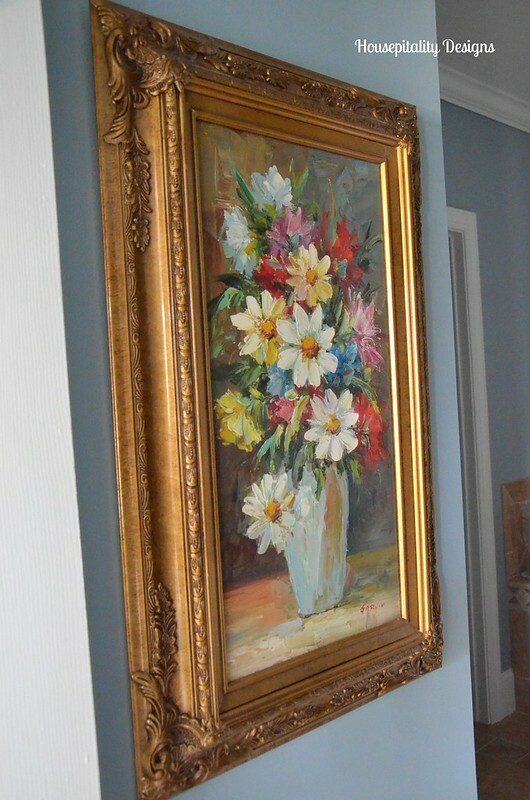 This pretty painting that I bought at a moving sale in our neighborhood . .
~ ~ seems to fit well in this spot and certainly adds “Spring” to the room. 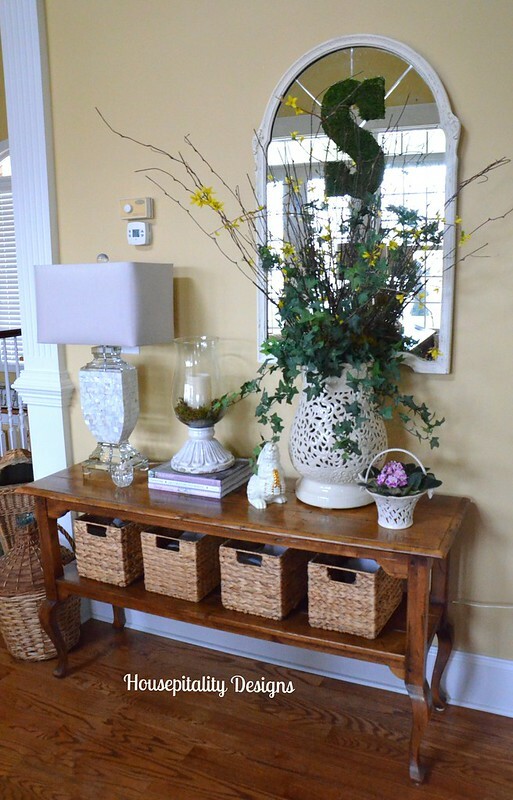 I purchased this pretty little table at the sale too! 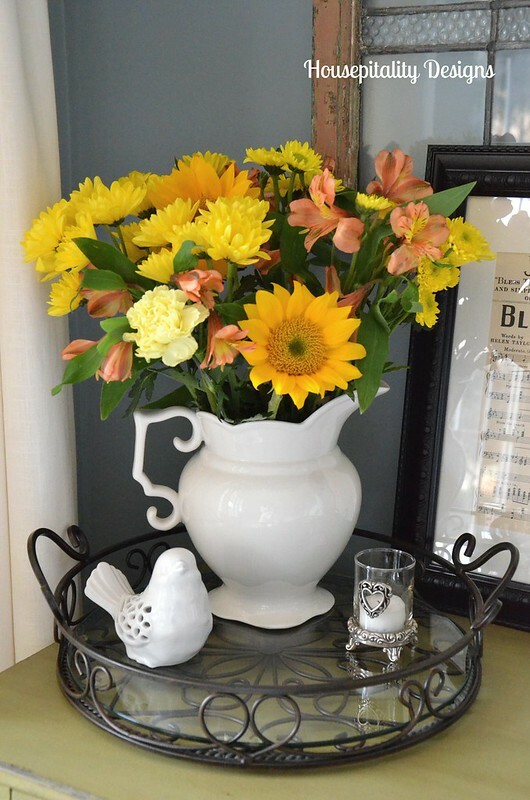 So with the addition of pretty floral decor, beautiful fresh Spring flowers . 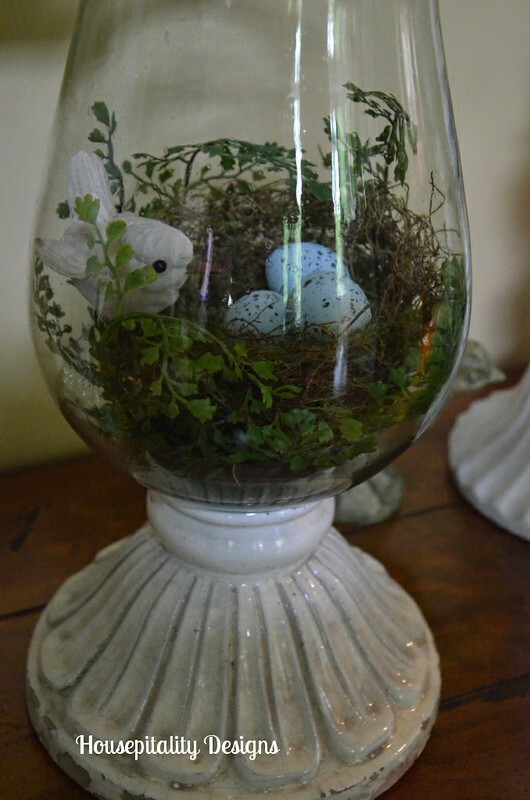 . .
~ ~ a painting of Spring flowers in a vase and places for birds to nest . 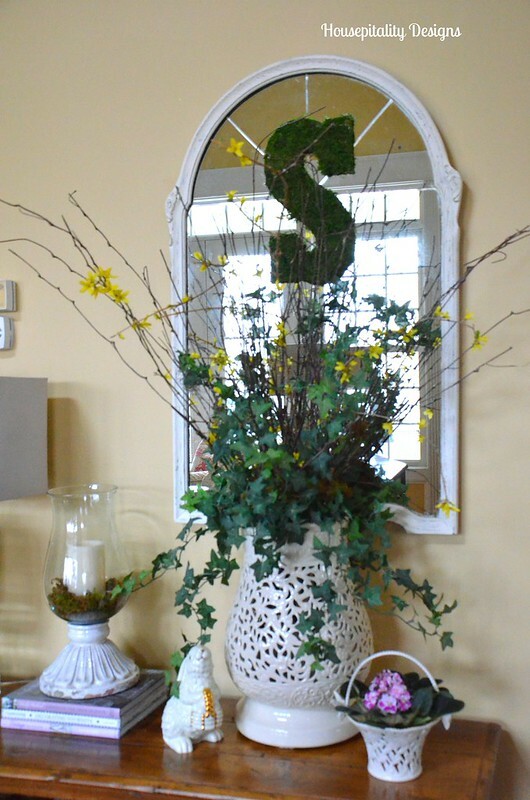 . .
~ ~ ~ ~ I think this room is ready for Spring!!! 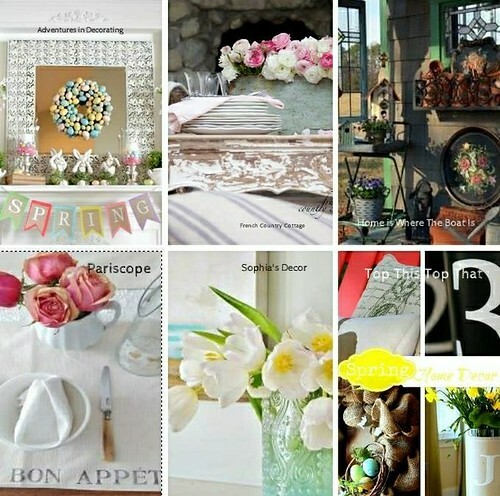 I am partying with 11 fellow friends/bloggers for great Spring Inspiration! 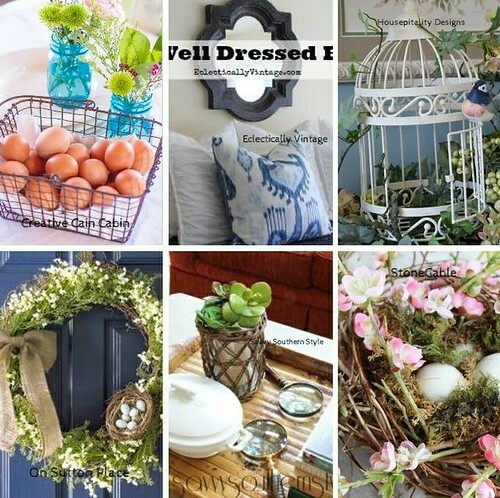 They have some incredible ideas for “Springifying” your home!! 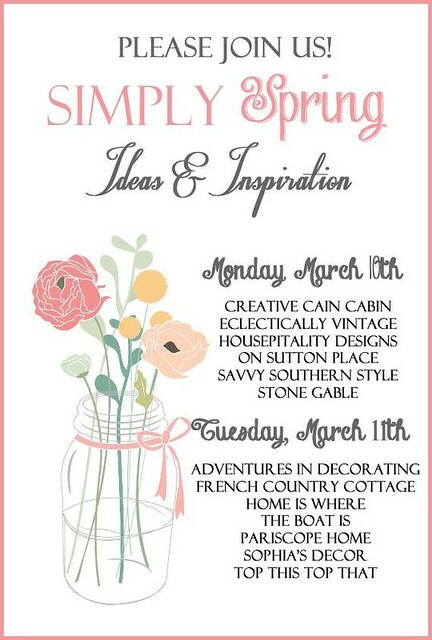 Stay tuned tomorrow for Day 2 of great Spring Inspiration. 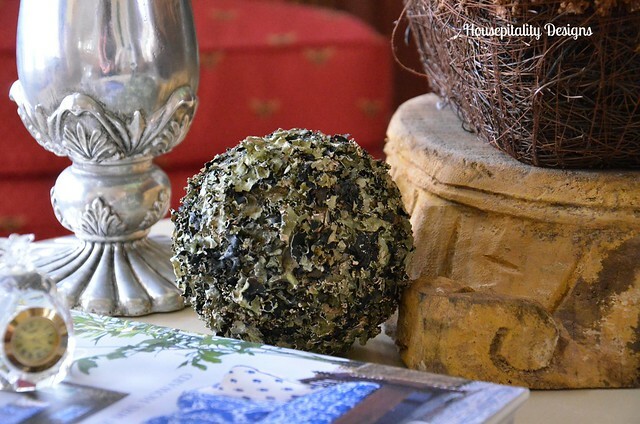 I am slowly adding my French Treasures into the decor of my home. 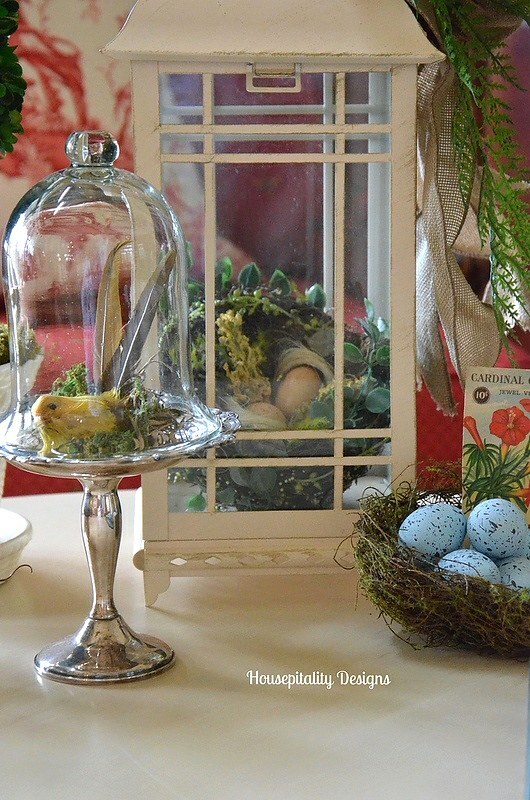 Today, I am displaying my antique French Apothecary Jar in a Spring Vignette . .
~ ~ yes, skipping Winter and going straight to Spring. I can see all the Winter decor I want outside my window!! 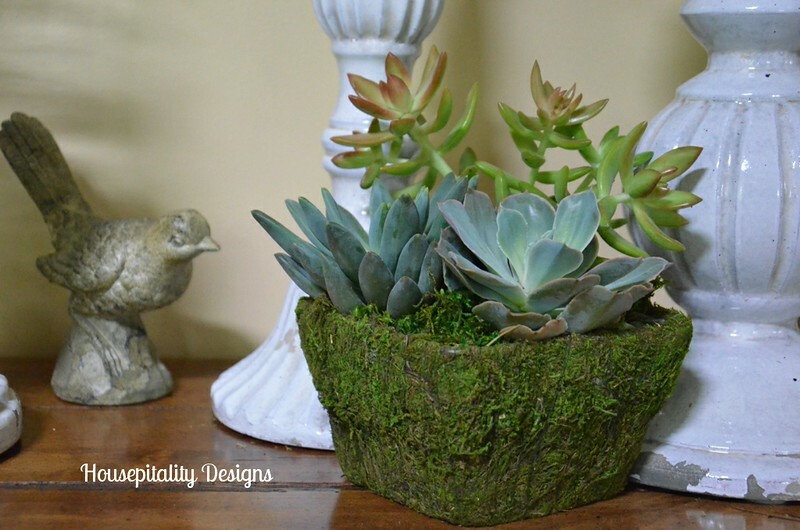 I wanted to keep the vignette light and simple..
~ ~ well, as simple as I get. 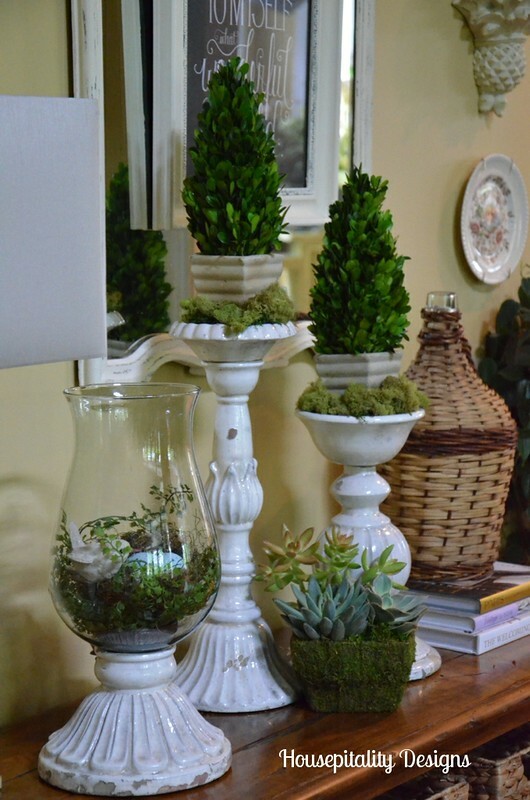 I used the apothecary jar as a vase in this vignette. 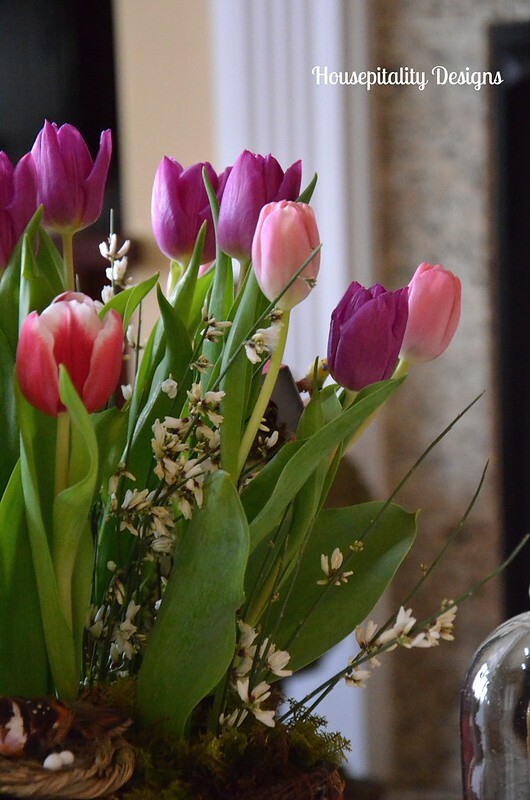 And added these pretty variegated tulips from Trader Joe’s. My granddaughter told me they are called Fire and Ice . . .
~ ~ really? 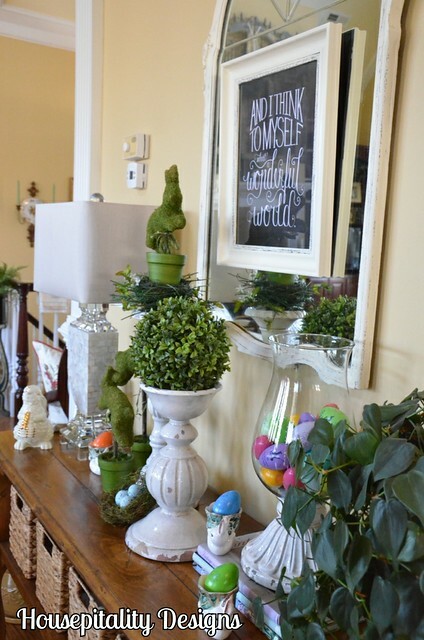 High five to my little 8 year old budding decorator. 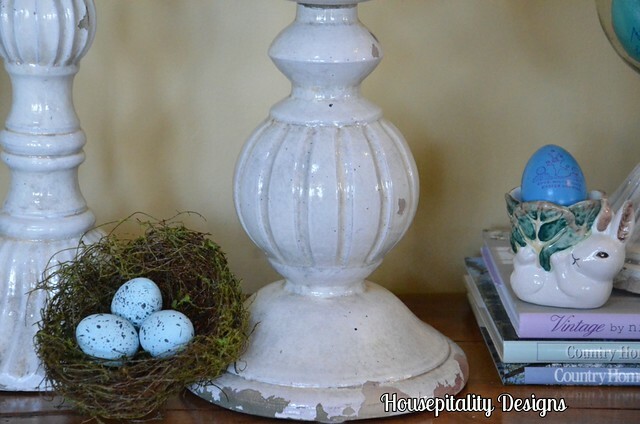 A Spring vignette is not complete without a bird’s nest . . and pretty speckled eggs. 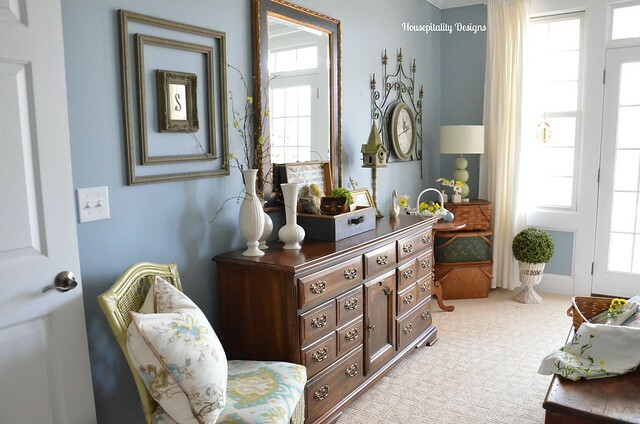 With a background of the monogrammed chair. 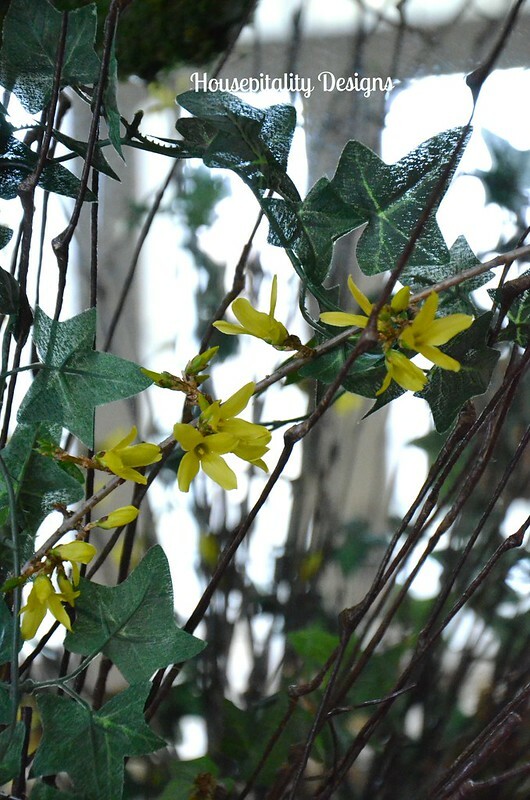 Thanks for stopping by and seeing my first hint of Spring in my home! 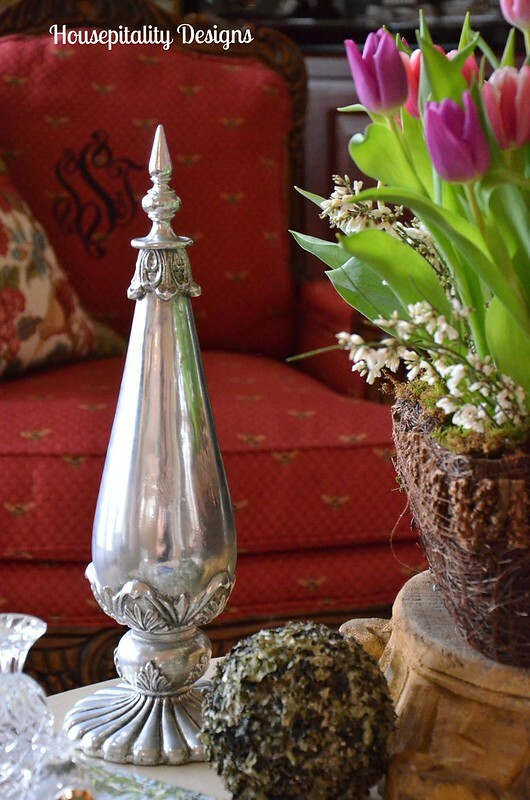 Still incorporating more of my France trip’s treasures into the decor..
And don’t forget to stop and smell the tulips!! 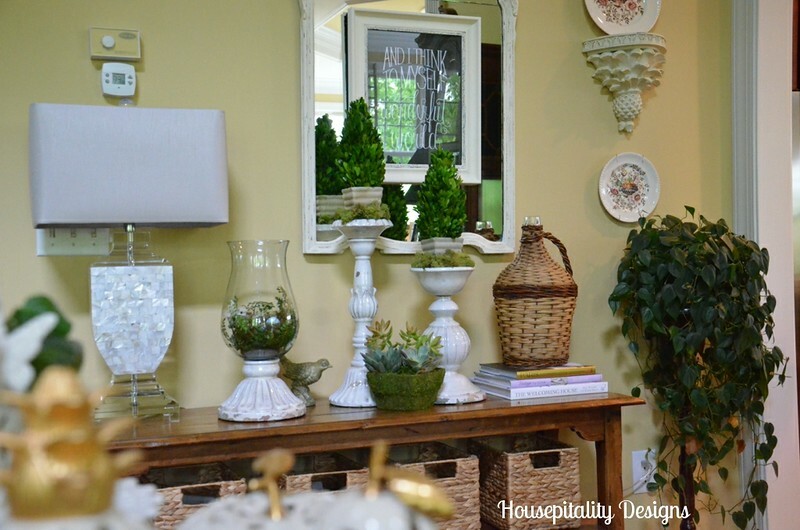 I love the versatility of my ceramic Pottery Barn Candlesticks and Leah Hurricane. 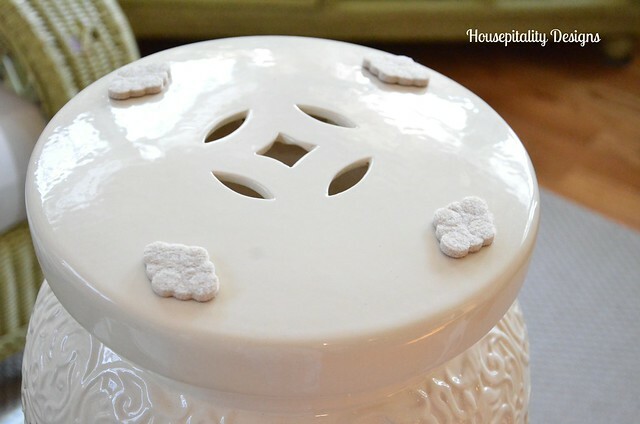 I use these pieces in so many different ways. 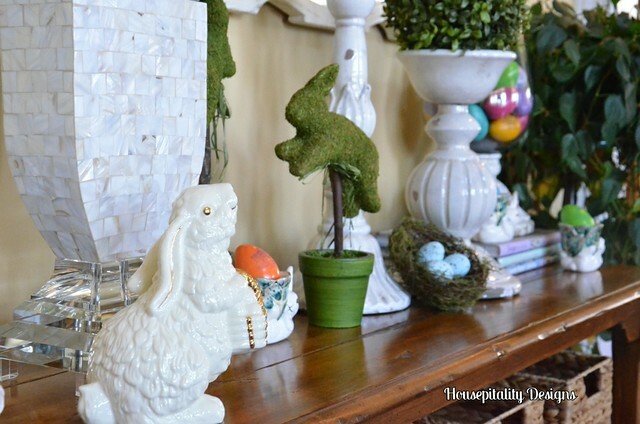 This vignette went from an Easter theme to Spring. 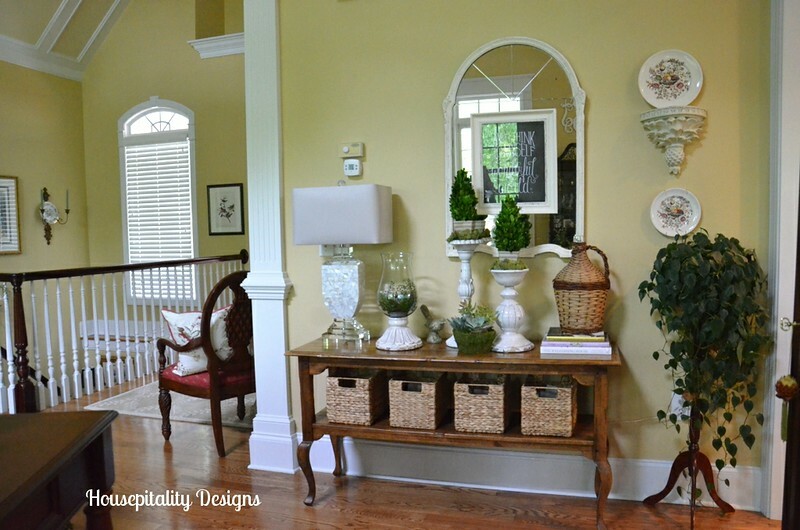 This table is in the passageway to the kitchen area. 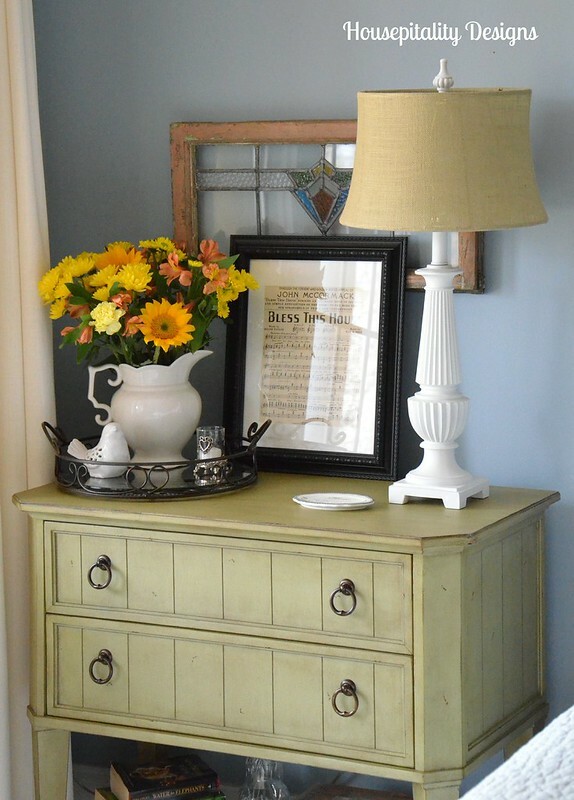 It was originally my sofa table many years ago. It is perfect for this narrow passageway. You can see part of the kitchen through the doorway. 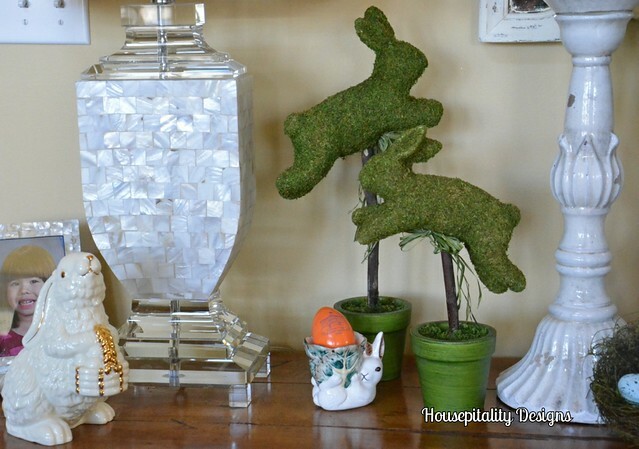 I placed reindeer moss at the base of the topiary for some color and texture. 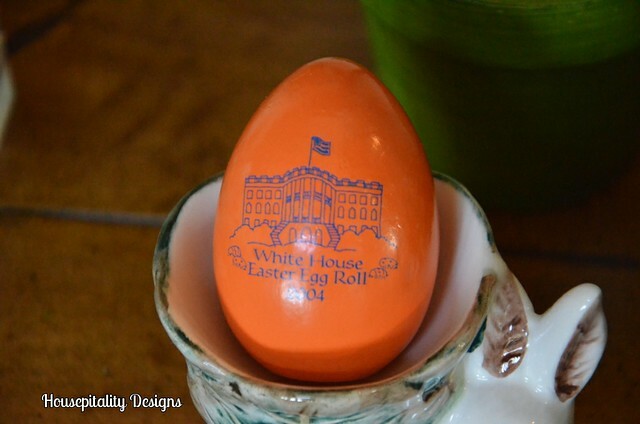 …..for Easter, I had filled it with my White House Easter Egg Roll Commemorative Eggs. 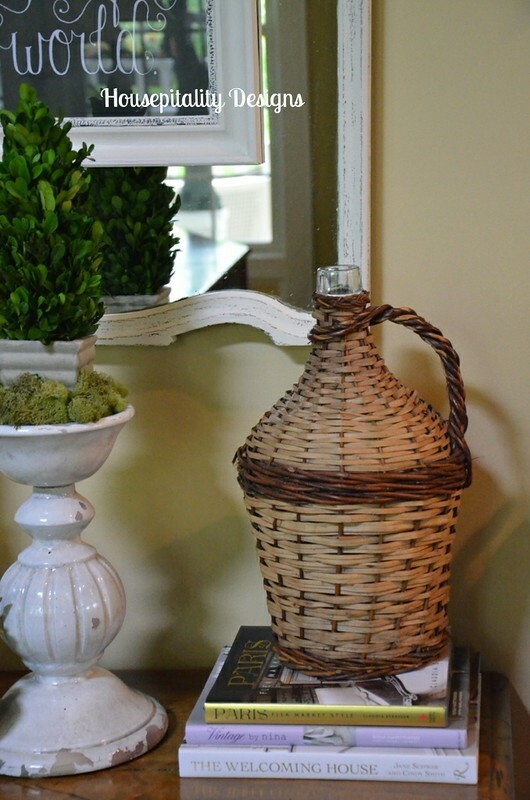 I purchased this pretty Demijohn at the High Point Market..it was a great deal..
…..so I could not wait to place it somewhere in my house…and it landed here. 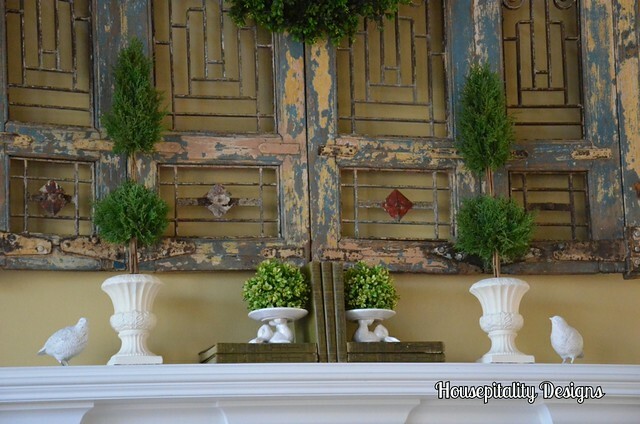 I love the color and texture it added to the vignette. ………. 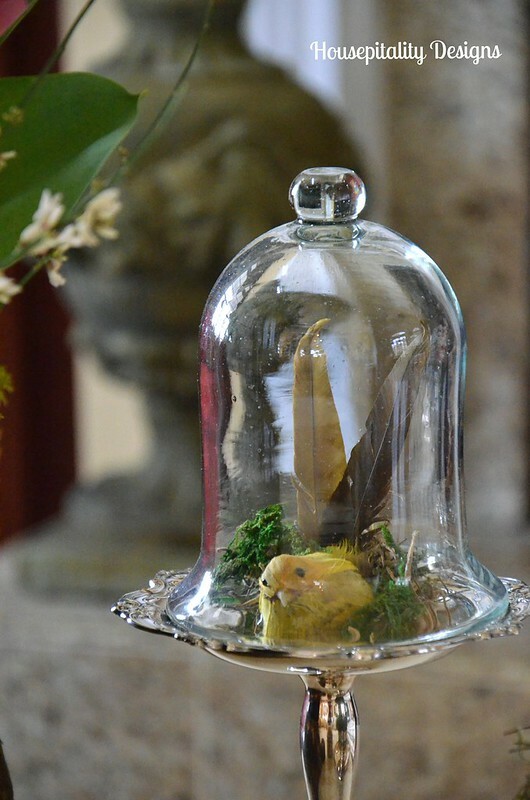 and Paris Flea Market Style (by Claudia Strasser). 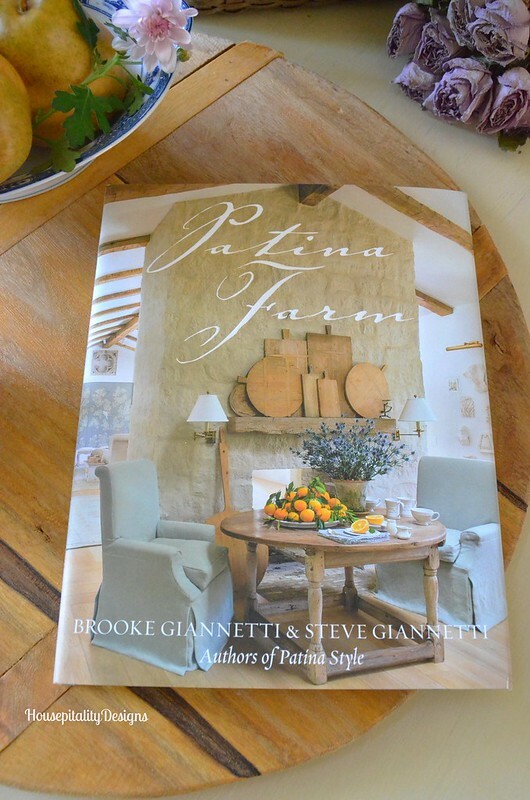 Both fabulous books! 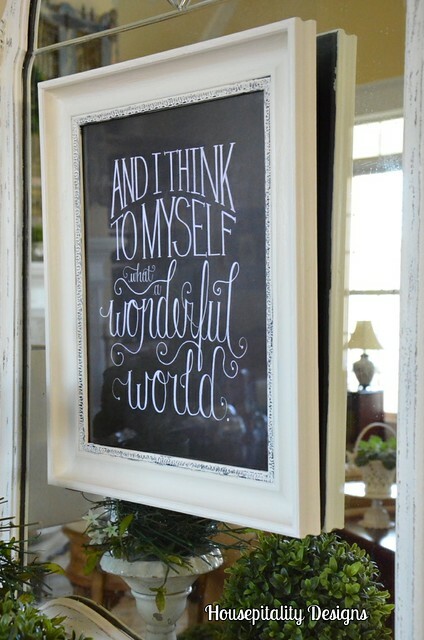 The chalkboard print remains on the mirror…I love it there. 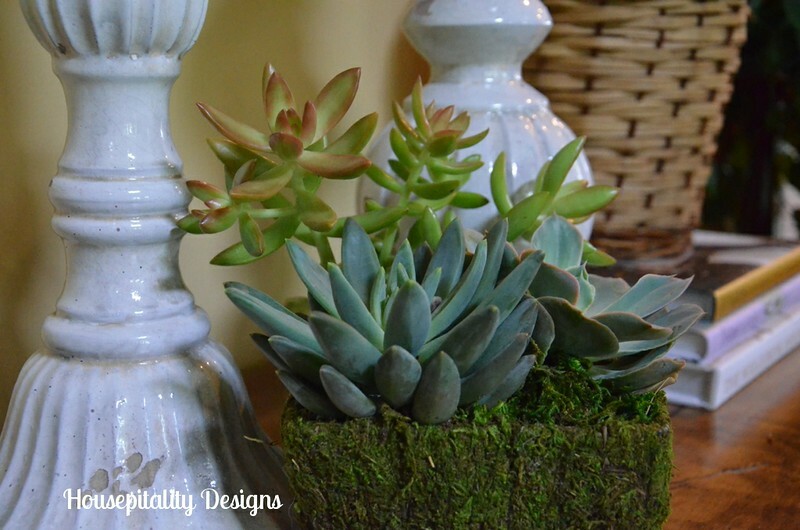 While at Trader Joe’s the other day, I spotted this pretty succulent arrangement…it quickly went in my cart! 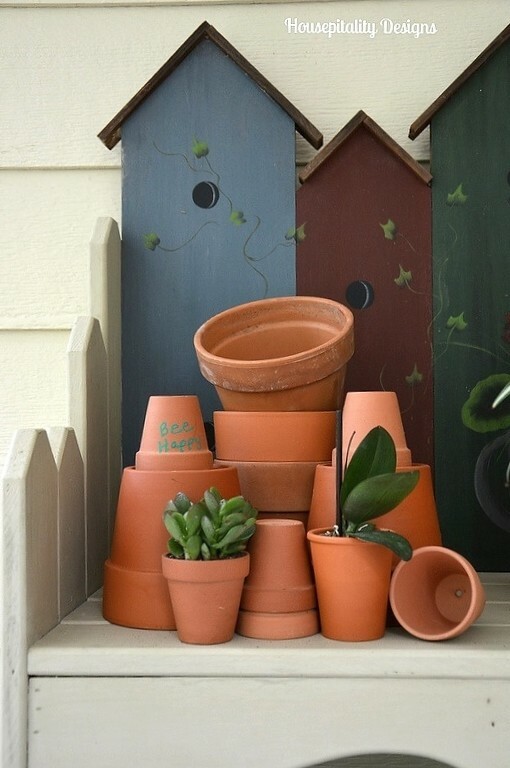 Just hoping that this does well in the house…Any tips out there? 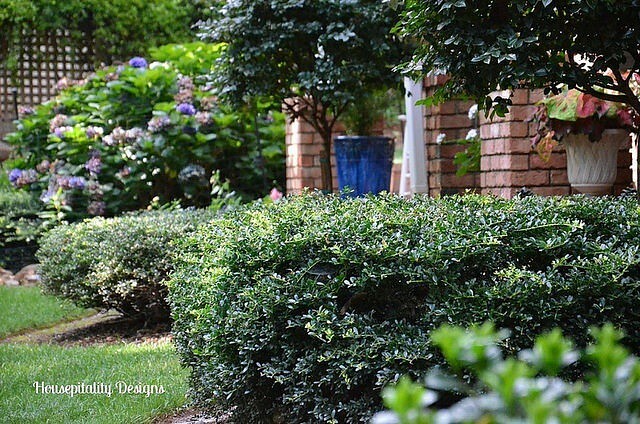 Thanks for visiting today…I am getting ready for more company today…lifetime friends. 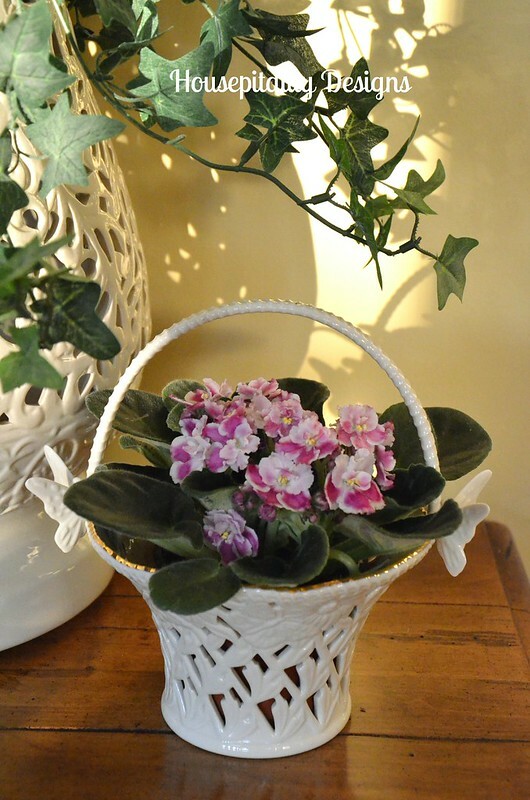 …..Jane from Cottage at the Crossroads has featured my friend Linda a couple of times. 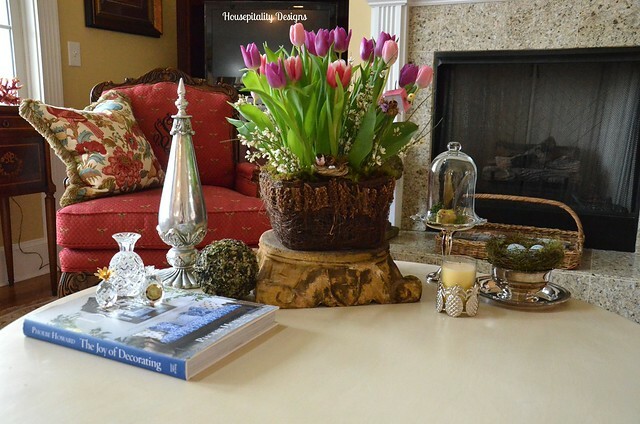 ……….One of Linda’s tablescapes and her beautiful deck that overlooks the magnificent Rocky Mountains. 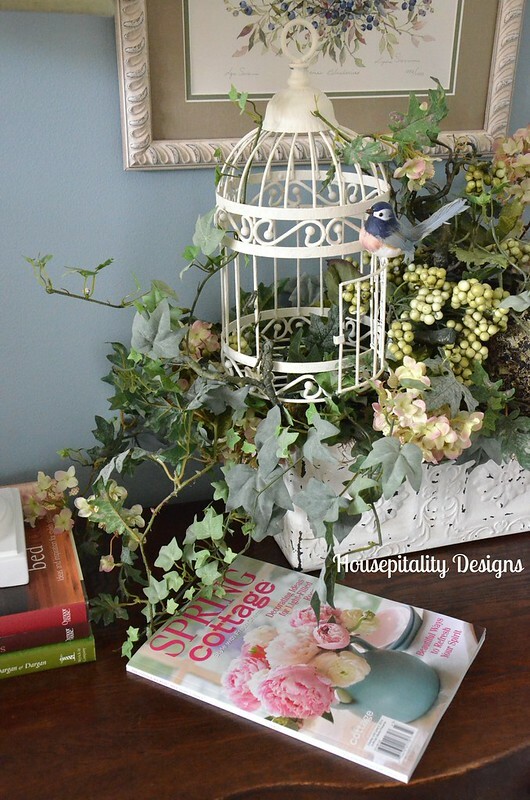 Jane has featured non-blogger/readers’ home decor projects and crafts on her blog..Such a nice feature! 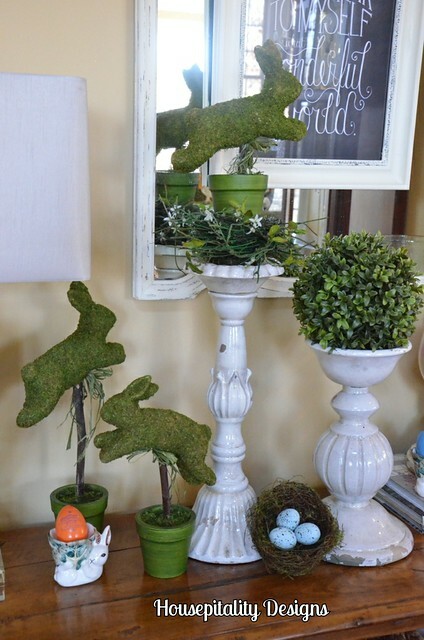 Well, the bunnies have chased away the birds …. 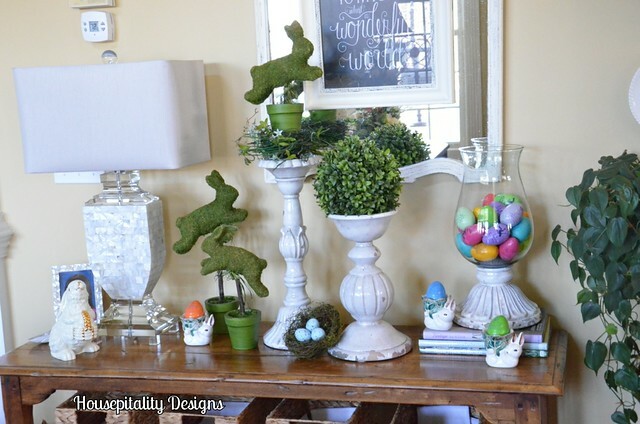 …..and the bunnies have playfully settled on the table. 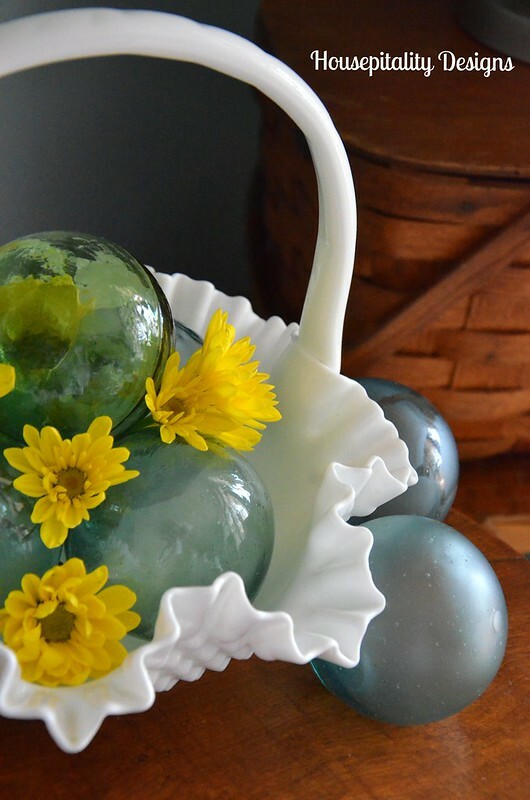 …..it was on the shelf above the stove…but I had to look up to enjoy it. 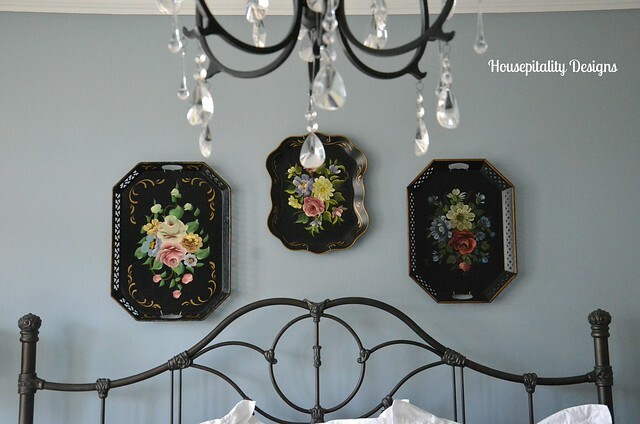 So I hung it “on” the mirror! 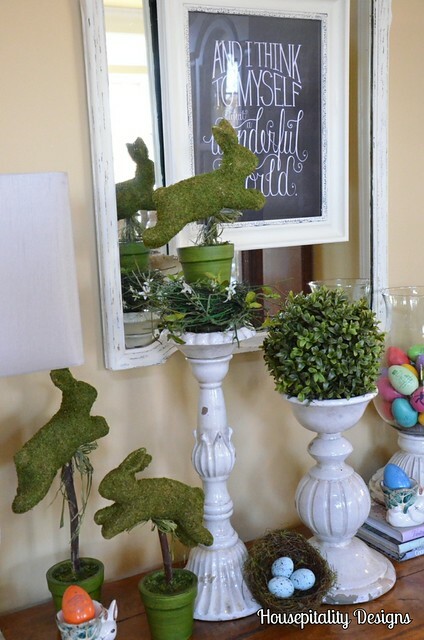 And if you want to know where the bunnies chased the birds off to…. 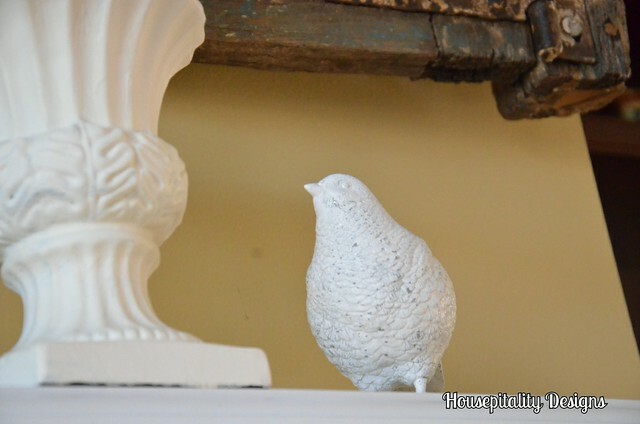 …..they landed on the mantel. Keeping the other bunnies company. 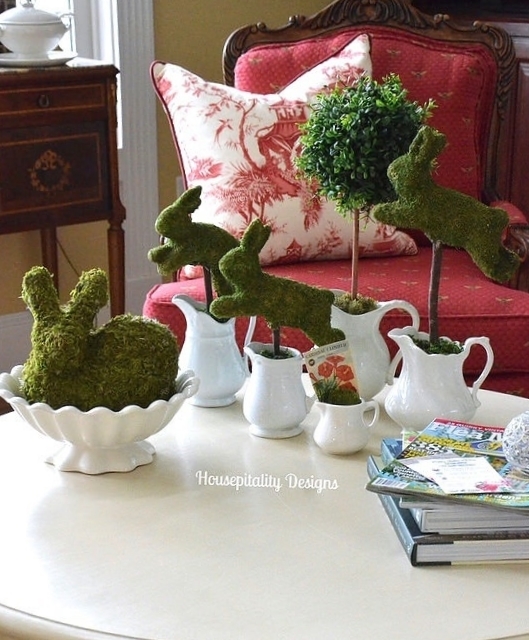 ….along with the bunny egg cups. 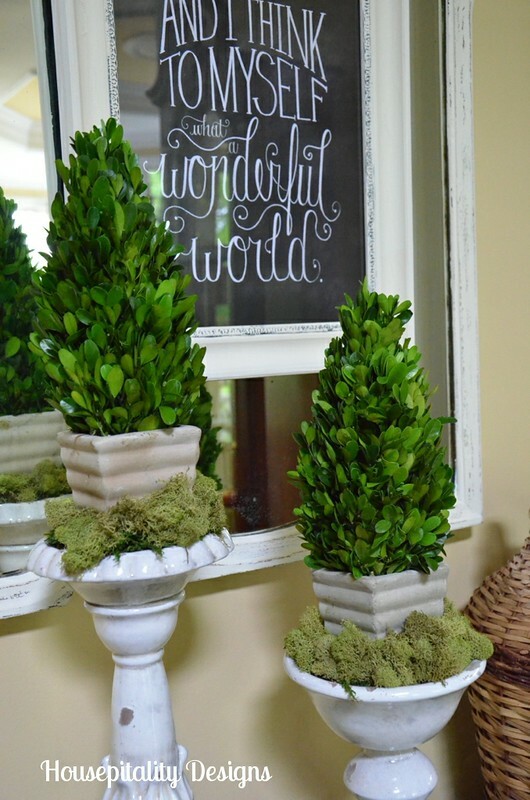 And it is such a “wonderful world/country”…. …..looking at me with that “I have two heads look”…. 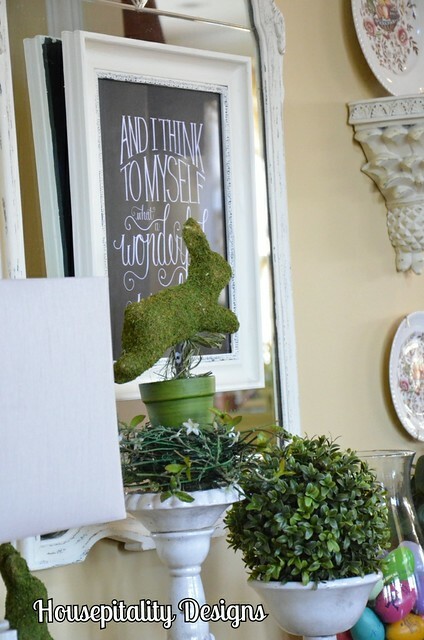 But after it was hung…he and I loved it!…I pass this table many times a day…. 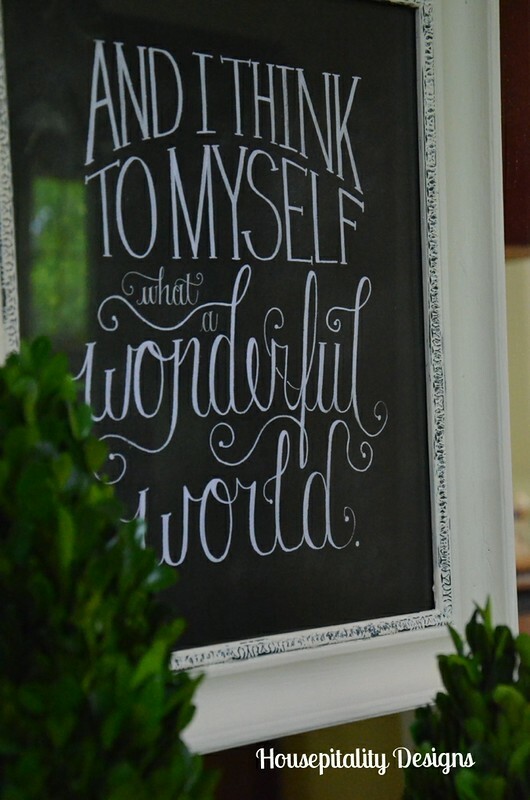 …..and it makes me smile! 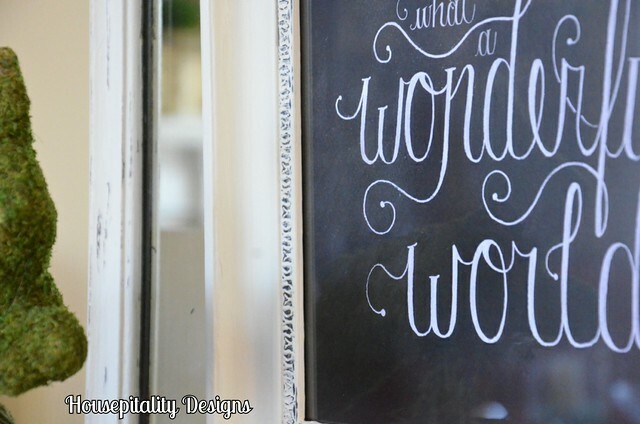 The artful writing is just amazing…. 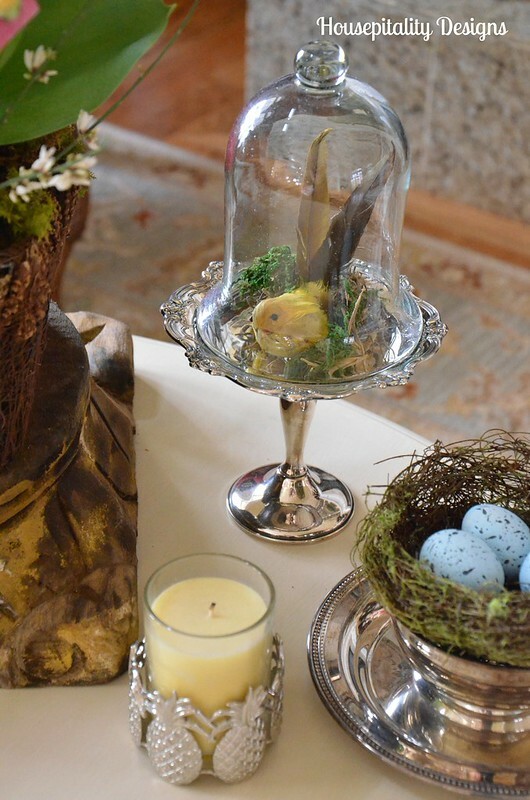 ……….but then I decided to place one of the bunnies on top of the candlestick tucked into a bird’s nest. 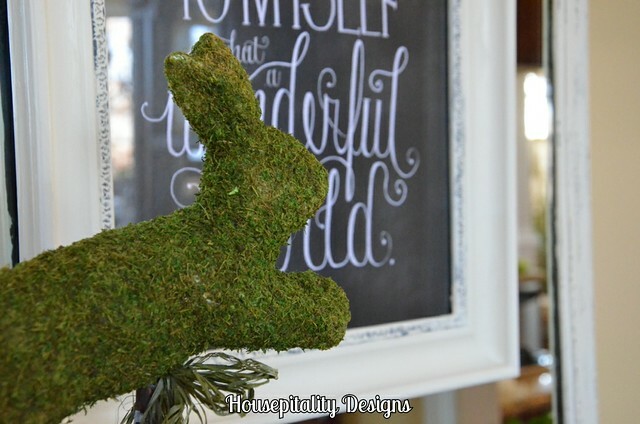 This bunny has special meaning…. 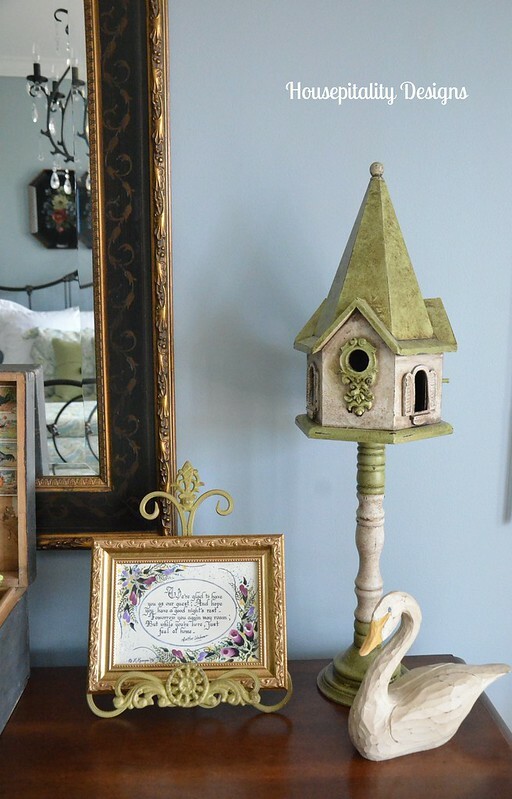 …..I was in Atlanta years ago…I dropped off my hubby at a client’s and I drove to one of my favorite shopping places. …..I barely got through the store and the phone rang…”I’m ready, you can pick me up now!…uugghh!!.. 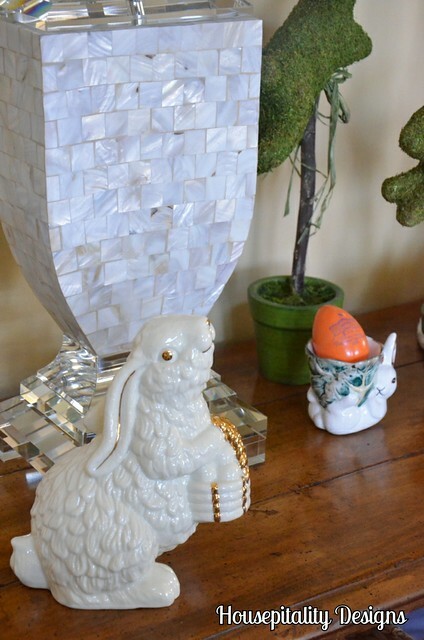 Now that “store” is HomeGoods!…So basically the pretty ivory bunny was my first purchase from HomeGoods! 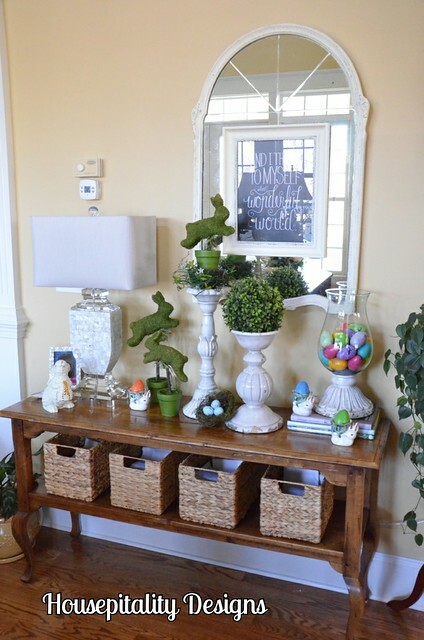 So here is the complete view of the Spring Vignette…. …..I am sure I will tweak it more in the next couple of weeks.